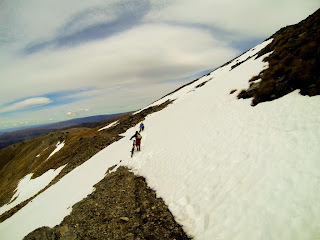 We all watched video clips on Internet, showing our idols bombing down snow-capped mountains, riding at the edge of deadly cliff, and floating over trails with awesome scenic view. 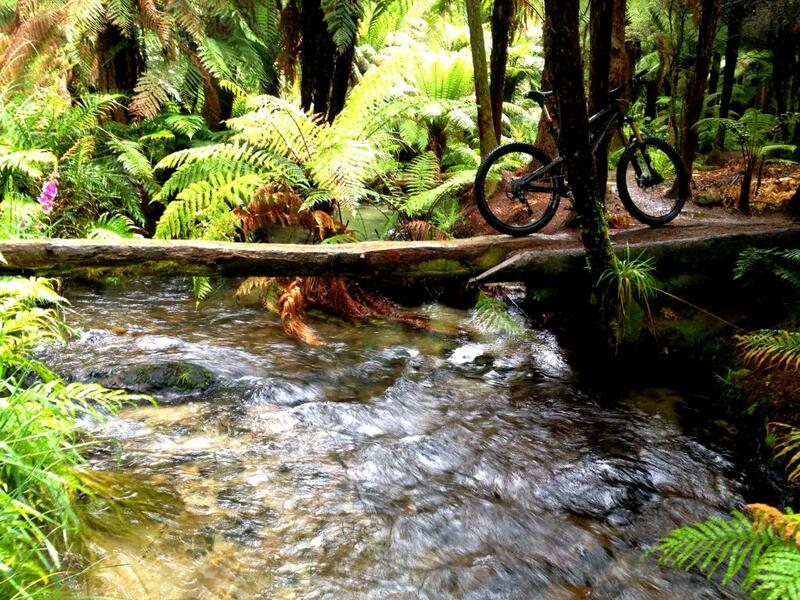 I am sure those clips have motivated many of us to dream of riding on those trails one day. 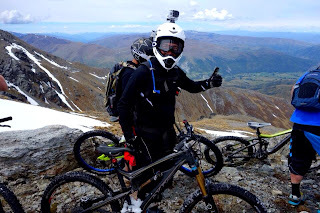 Besides Whistle in Canada, New Zealand (NZ) seems to be featured in many of those spectacular MTB movies, with famous New Zealanders such as Brook and George. 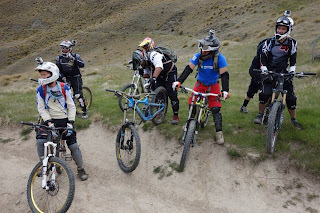 Despite a small population of only 4.4 million people, New Zealand has produced many world class riders, including Brook MACDONALD and George BRANNIGAN, who rank 6th and 9th respectively in 2012 Downhill category. Others include Cameron COLE and Samuel BLENKINSOP, all below 25 years old with many more production years to go. 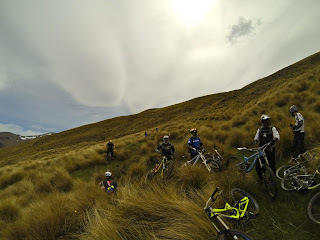 There must be some critical success factors that made New Zealand so successful in downhill MTB in such a short span of time. 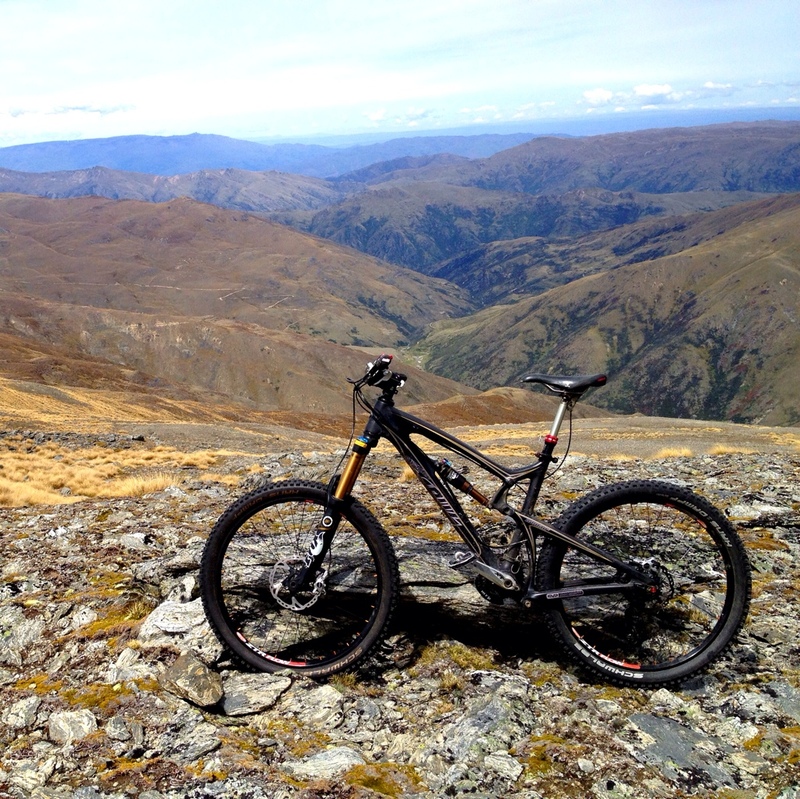 New Zealand has become the South of Whistler, which in my opinion may overtake Canada one day. 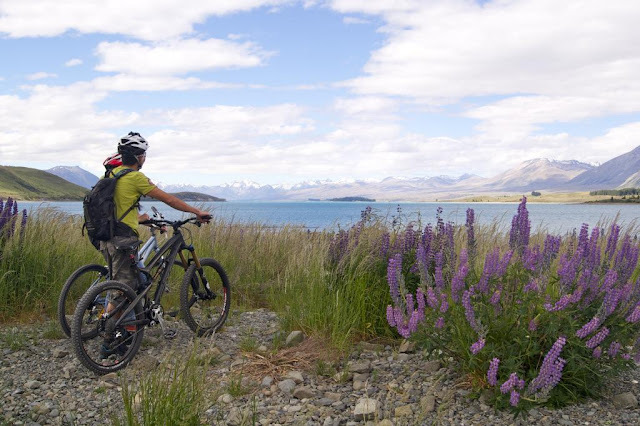 In 2009, the New Zealand National-led government has committed NZ$50 million over three years to build cycling trails all over New Zealand. The objective is to to build a valuable new asset for the tourism industry with lasting economic benefits. 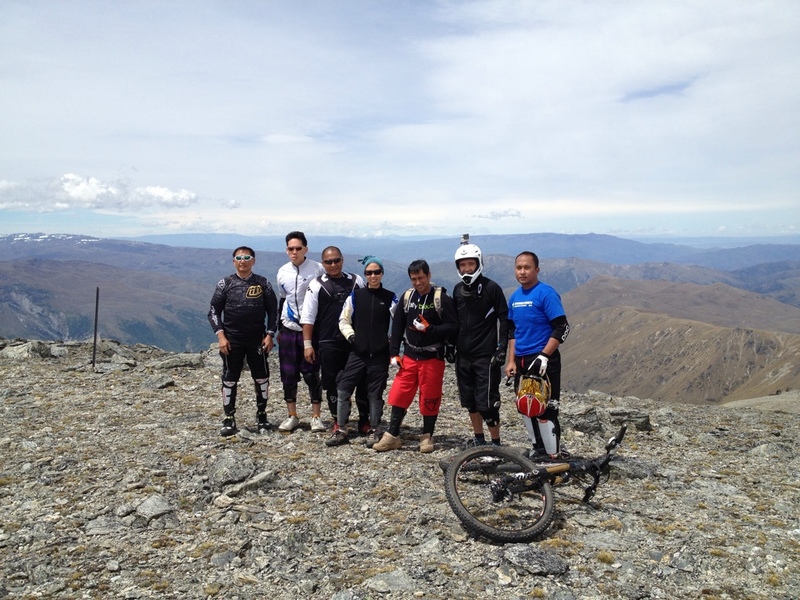 The foresight of Mr. John Key, who is the Prime Minister and Minister for Tourism has made New Zealand the Mecca of mountain biking in a short span of 3 years. The initiative not only bring economic benefits to New Zealand, but improves the social well-being of all residents in New Zealand. (Photo: Church of Good Shepherd) December is the best month to ride in New Zealand, as it is the beginning of summer. The long daylight of 15 to 16 hours will allow you to ride as long as you desire. To convince my wife to go New Zealand during December school holidays was not easy. She preferred North while I preferred South. Mountain biking in NZ must not be on negotiation table! Transport bike: The decision to bring my bike to New Zealand is similar to the idea of bringing my own pillow while traveling. The differences are the carrying cost and trouble: weight penalty for air flight, hefty ground transport fees for bigger taxi; bigger rental cars; and limited choice for motels (e.g. ground unit, secured storage and washing bay). To save weight, you may consider using cartoon box to store your bike. Many of my riding mates had done that. Personally, I preferred the protection of EVOC bag, and the ease of handling. However, it is expensive ($470 to $550) and weigh more than 10kg. The total weight of my loaded EVOC bag was about 23kg without pedals, within the legal limit of check-in luggage imposed by British airway. 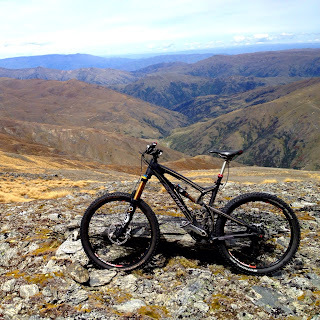 Type of bike: Depending on the type of rides you want to do in NZ, all-mountain bike is all you need to ride in New Zealand. Alternatively, you may want to consider 70/30 rule. If 70% of your ride would be downhill, bring your DH bike and rent trail bike for XC ride. 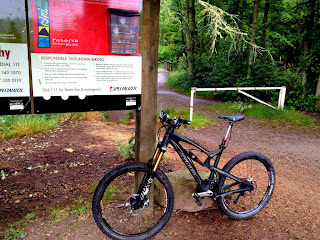 If 70% of your ride would be trails or XC, bring your all-mountain bike and rent DH bike if needed. 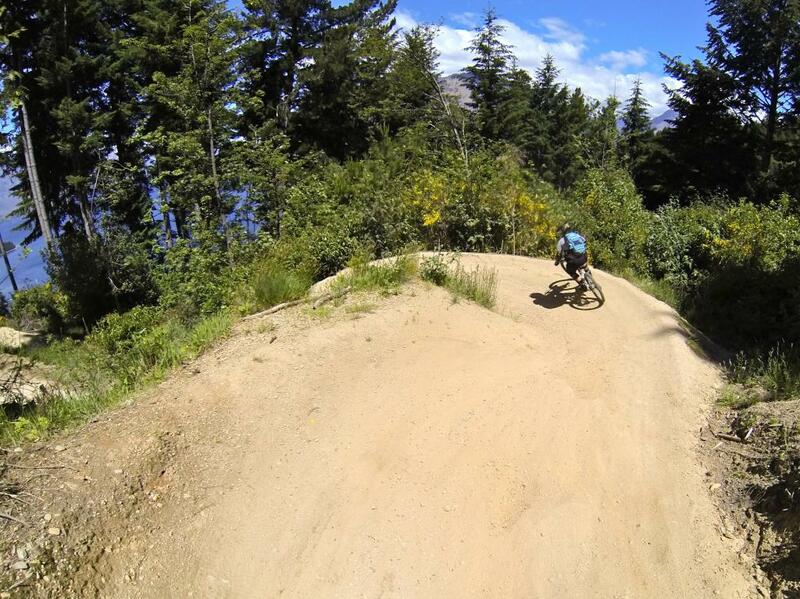 If Queenstown Skyline Bike Park is your only reason to be there, DH bike would be the obvious choice. 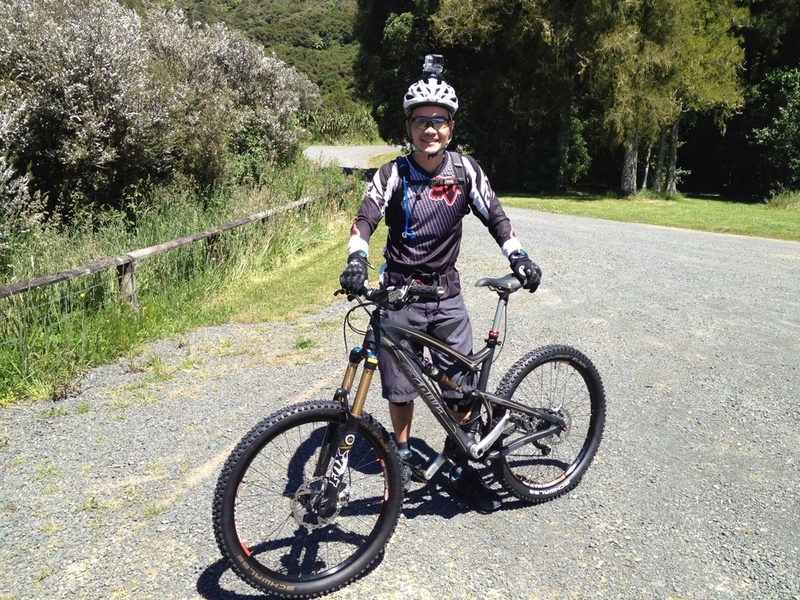 For me, Santa Cruz all-mountain bike (Nomad Carbon) would fulfill all my rides: downhill, freeride, trails and XC! 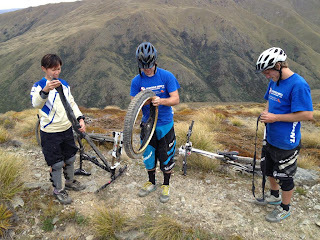 Bike servicing: You can either self-service your bike or send it to good mechanics for servicing before you packed it for New Zealand. 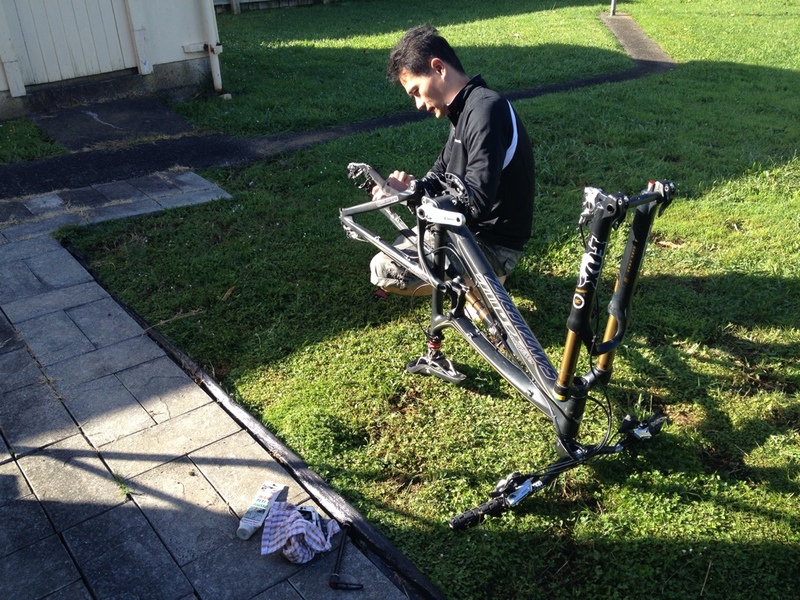 As usual, I always send my bike to Winson's (ReEvolution Bike Shop) for servicing. Checklist includes drive chain mechanism, tires and brake system. Replace new brake pads if possible unless they are still new. Ensure your bike is sparkling clean as NZ immigration officers are very strict on cleanliness. They are doing their job to protect the agriculture and ecosystem in New Zealand. 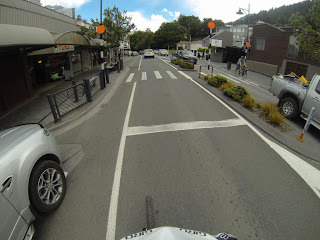 Types of gears: Depending on the type of rides you want to do in NZ, the gears you need include full protection gears (e.g. 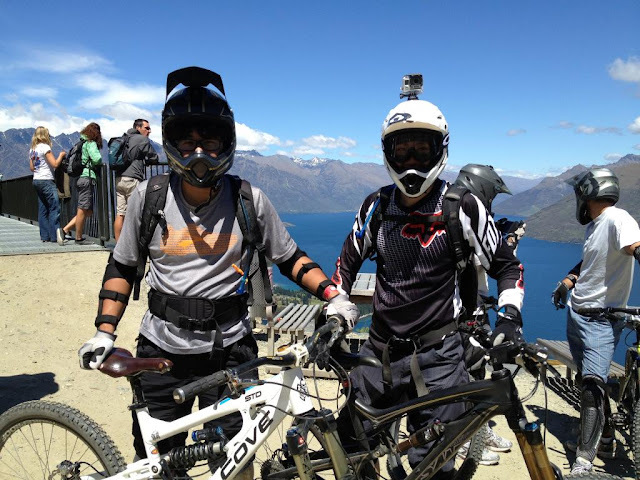 full face helmet, goggle, knee/shine guards, elbow guard, wrist guard, neck brace, body armor and glove) if you do downhill ride; XC helmet, knee guards and sunglasses if you do trails and XC; extra brake pads; safety box; sun tan lotion; and basic tools/oils to service your bikes if needed. Warm clothing, windbreaker and rain jacket are necessary even during summer months (e.g. December), as the weather in NZ can be quite erratic. Packing: Your luggage will most probably overweight if you bring along your bike. 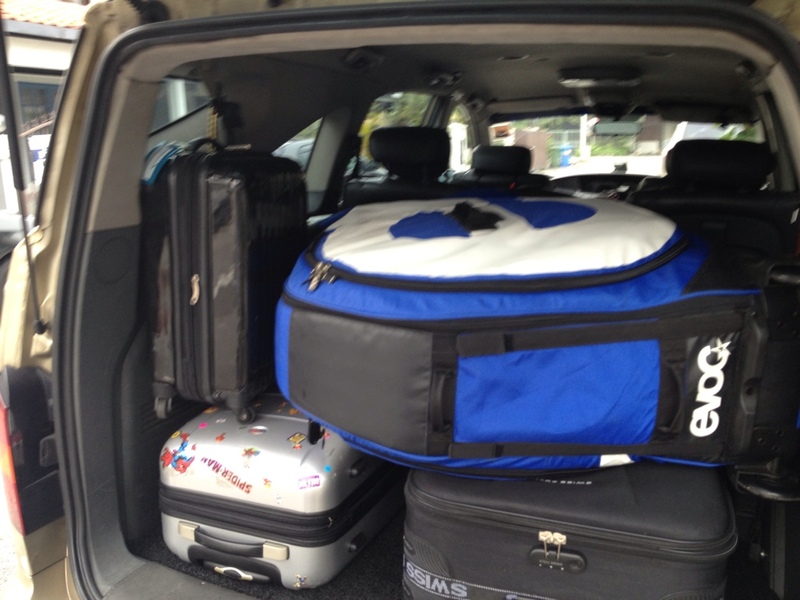 I was fortunate to share my load with my family as their luggage were grossly underweight. 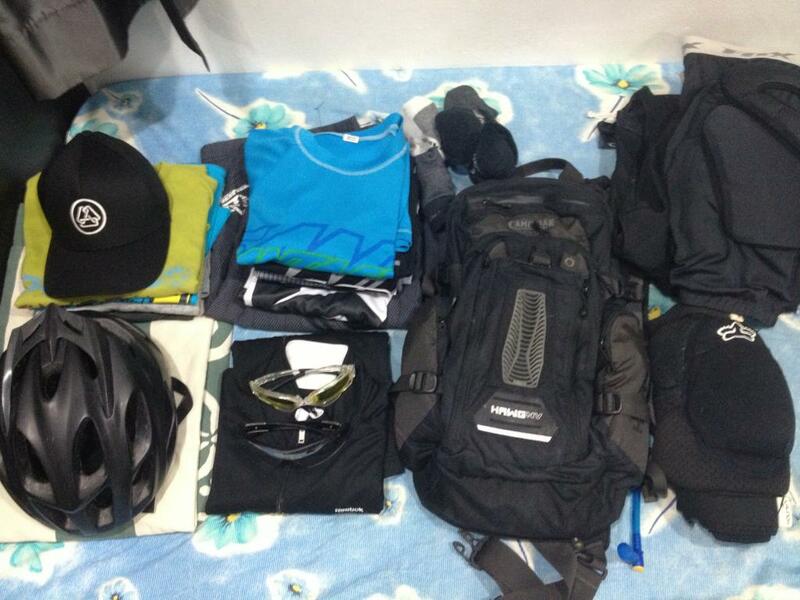 The trick is to load your hand carry luggage to the maximum limit (about 7kg) and put the rest into the bike bag (e.g. check-in bag). The standard weight restriction ranged from 20kg to 23kg. It is cheaper to pay additional check-in luggage in advance instead of paying penalty charges for overweight during check-in. Lodging: Rule of thumb, select lodging that is nearest to the trails or within riding distance. 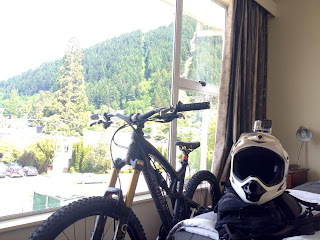 The lodge should preferably provide secured bike storage or allow you to store your precious bike in your room. 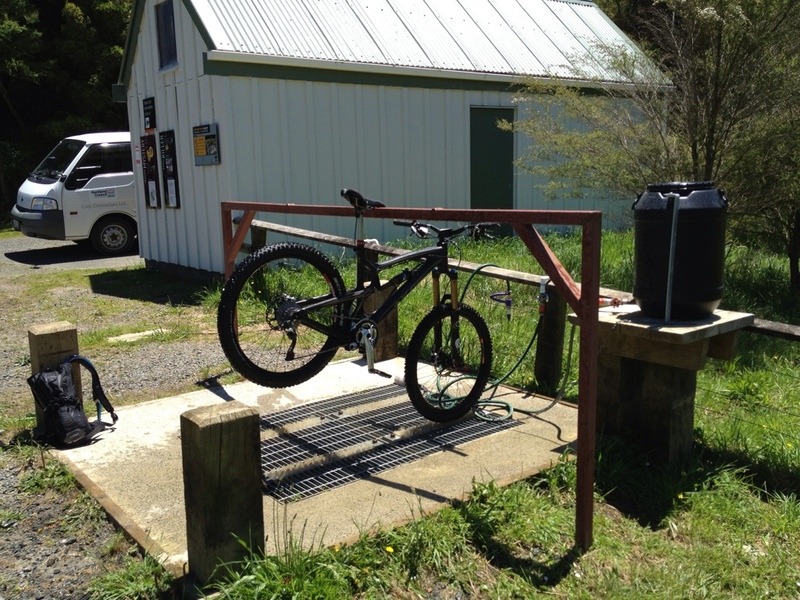 Other not so important selection criteria include wash bike facilities, as almost all legal bike trails in NZ provide bike washing facilities. 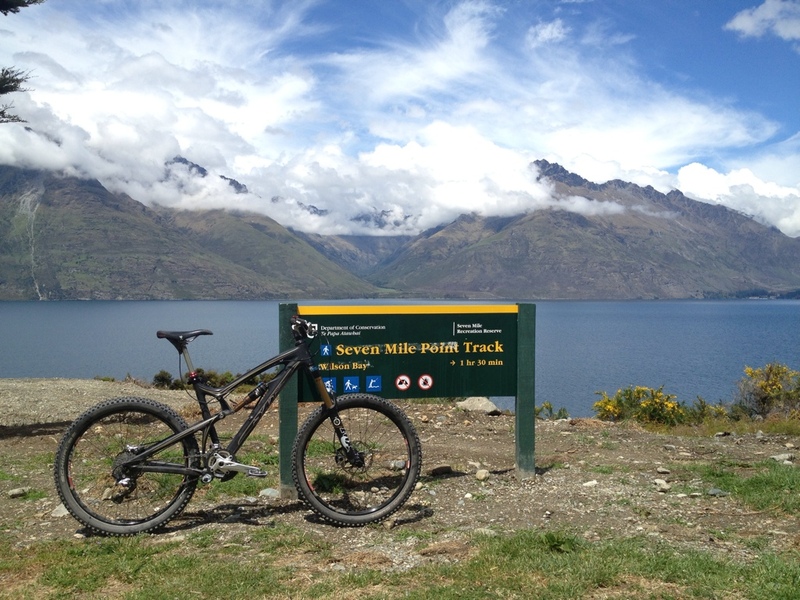 For me, I chose to stay in Amber Lodge - within walking distance to the heart of Queenstown city centre and short ride to Skyline bike park. We paid $130 per night for 3 persons with en-suite facilities. Transportation: If you intend to stay in only one location, car rental is unnecessary as you can commute around in mountain bike. If you intend to explore elsewhere regularly, car rental is necessary. My advise is to go for 4WD with big cargo space to carry your bike. I paid about $140 per day for this Prado, including insurance and reduced access. 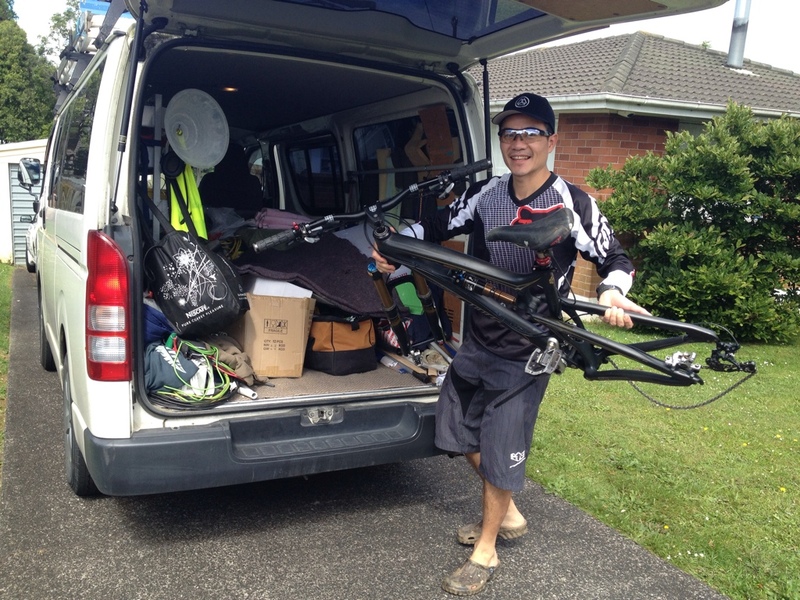 Given a second chance, I would rent 4WD van instead as Prado cargo space is a bit small for my bike. My first ride in New Zealand is at Hunua Ranges Regional Park, the largest forested landscape in Auckland. 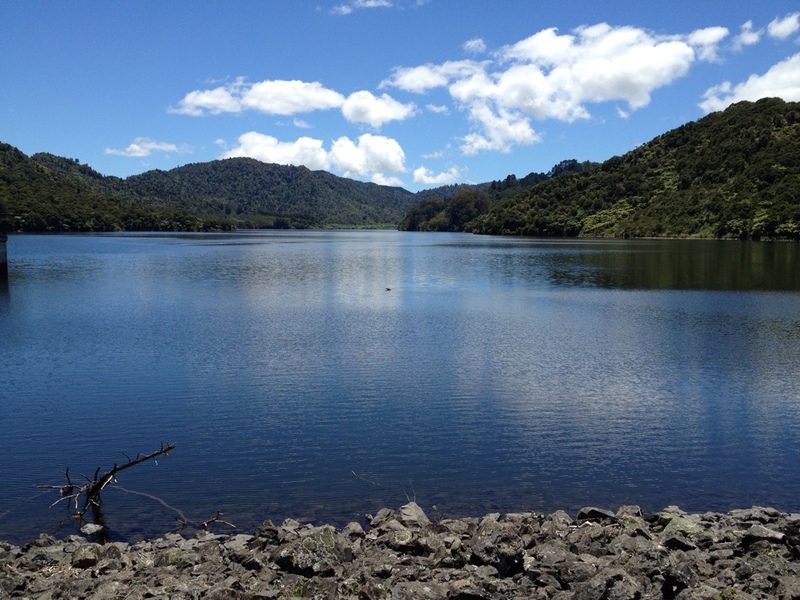 It boasted 14,000 hectares of native forest that filter rain water into four dams, supplying much needed water to Auckland region. The make-up and intend are very similar to Bukit Timah Reserved in Singapore. If you observed above photo, the view resembles the reservoir next to the Butterfly trails in Singapore. The Hunua Ranges Regional Park consist of 3 mountain bike trails: (1) Managatawhiri Challenge Track (2 hours return, 15km); (2) Valley Loop Track (1.5 hours return, 14km); and (3) Mounoukai Farm Track (1hr 45min return, 15km). As I had only half-day riding time, I decided to go with the most difficult track - the Managatawhiri Challenge Track. 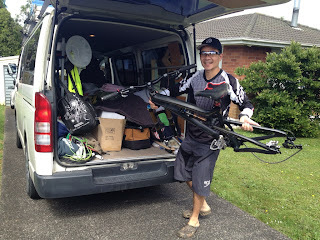 I was loading my Nomad into my brother-in-law's van. We were fortunate to bund in his house for free and had him drove us to the Hunua Range Regional Park. 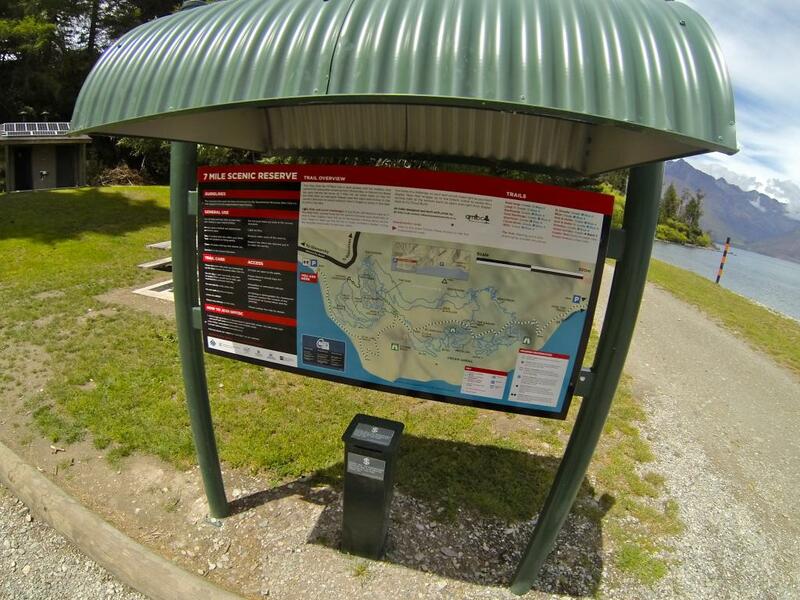 The park is just a short drive from his house at Papakura. If you were in Auckland city centre, just travel south on SH1 (motorway) and take Papakura exit. 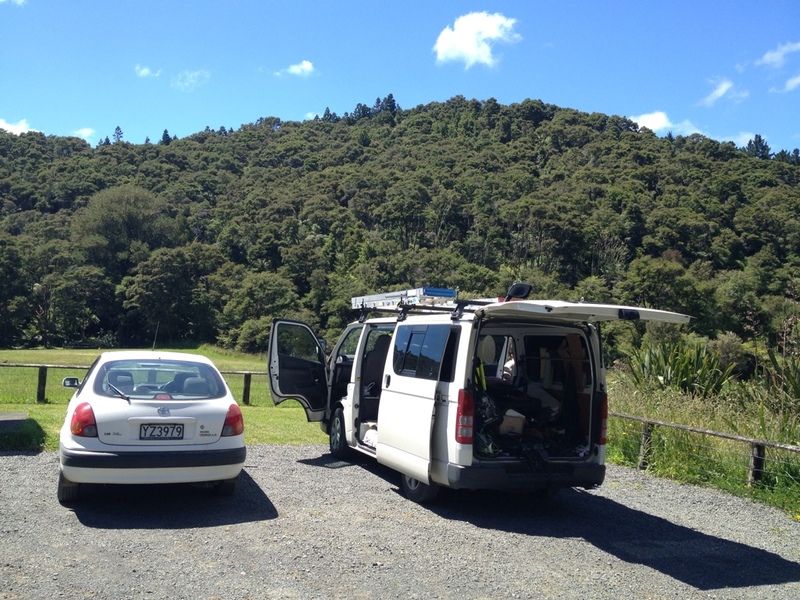 Drives along Beach Road, Settlement Road, turn right into Hunua Road and get to your destination at Hunua village. 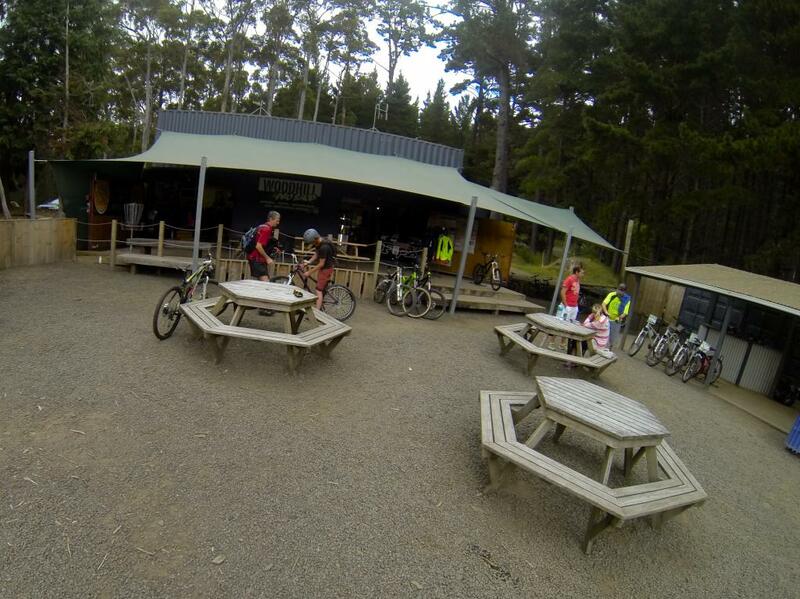 This is the car park area just before the entrance to the mountain bike trails. The toilets and bike washing bay are located here as well. I was ready to go. This shot was taken by my son, before they went to walking tracks in Hunua Fall and Suspension Bridge Loop. 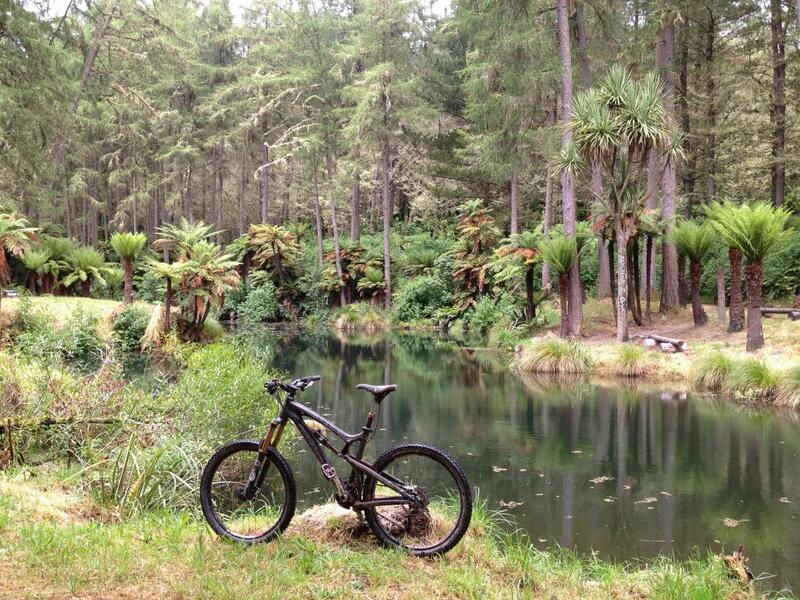 A short distance ride from the car park will bring you here (Photo). This entrance will lead you to Managatawhiri Challenge Track. 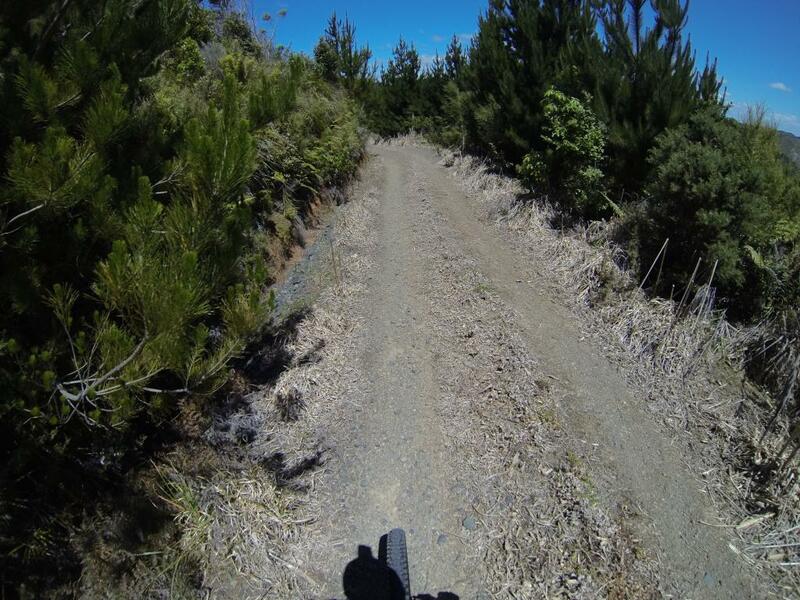 The initial 5km along the Waterline Keeney Road made up of mainly gravel roads with torturing climb. Pedal your way up until you reach a 3 way junction as shown in the photo below. The single track is located on the left side of this junction. 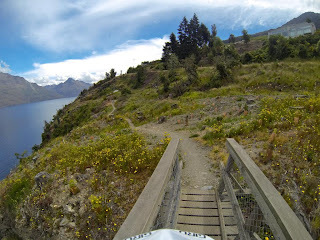 My advise is to take a short break here after the long climb, otherwise you will probably left with just enough strength to push your bike up the single track ...unless you are super fit! 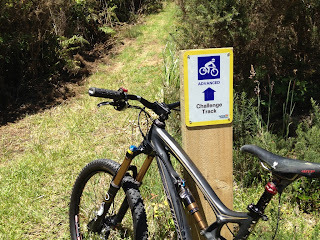 Entry to single track. The challenge track was designed for advance rider. The track is difficult and is not recommended in wet condition. 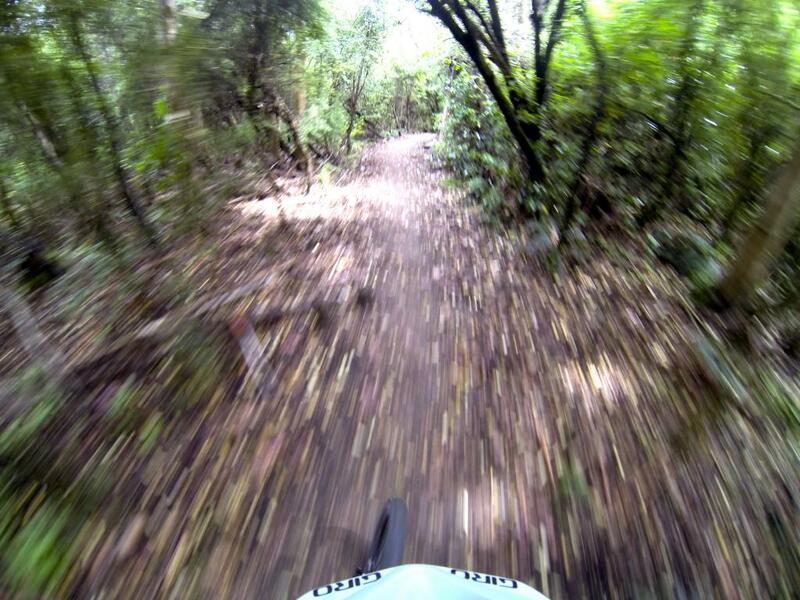 Unfortunately, I rode this track just 2 days after a deadly tornado that killed 3 persons in West Auckland. 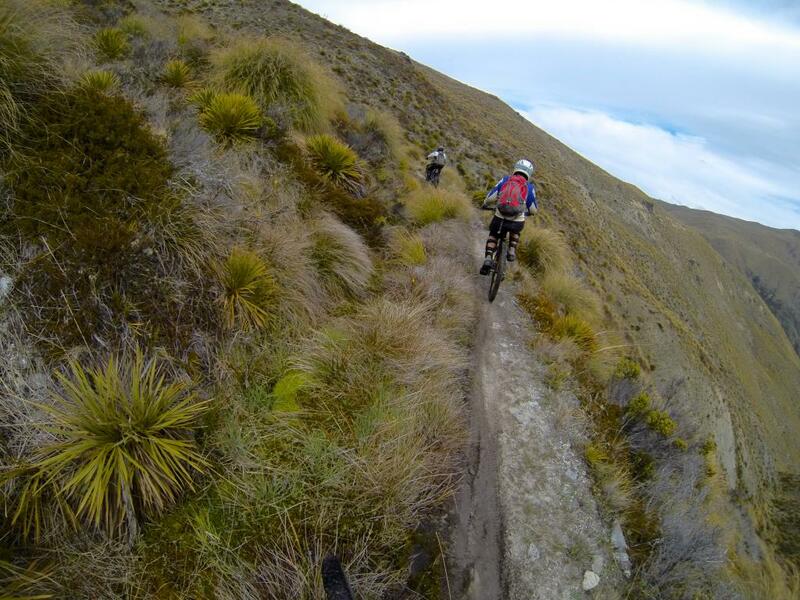 The tortuous climb continues along the single track until you reach the peak. The trails were filled with overgrown grass, holes and fallen branches. You will be rewarded with some awesome downhill sections, but the storm-battled forest had made the trails unrideable. Not an ideal time to ride after the storm! This eye therapy will be the reward after the ride. Does it resemble our unofficial Butterfly trails in Bukit Timah Reserved? Unless you love to climb, the challenge track is not for those with weak legs and cardio. However, you will be rewarded at the peak, as the downhill is pretty awesome. 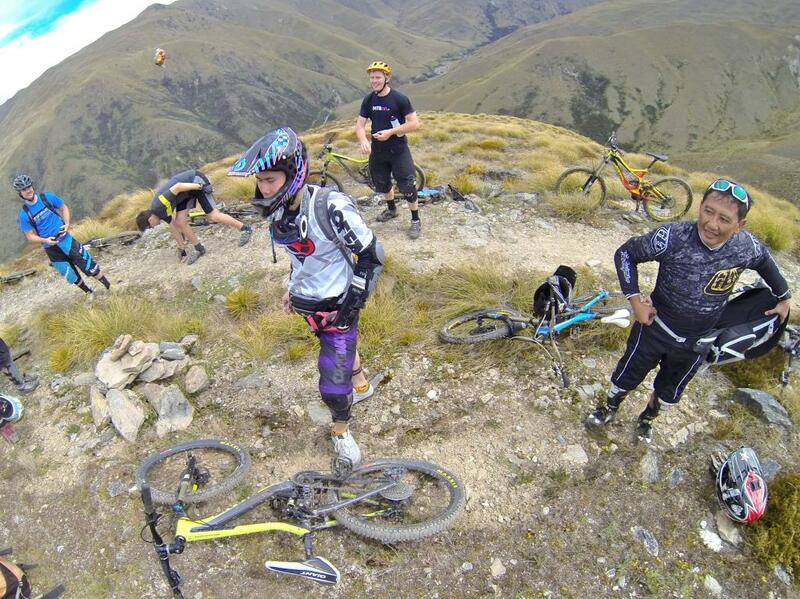 For me, it was a good warm up for the long waited ride in Queenstown Skyline Bike Park. 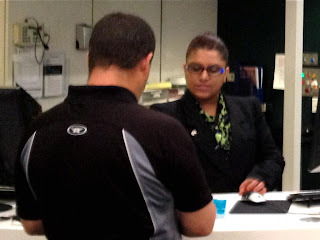 The whole trip in New Zealand could have been perfect if we did not meet this Air New Zealand customer officer (Photo left) during domestic flight check-in. We were very sure all our luggage were within the airline legal limit as we weighed them at home before check-in. 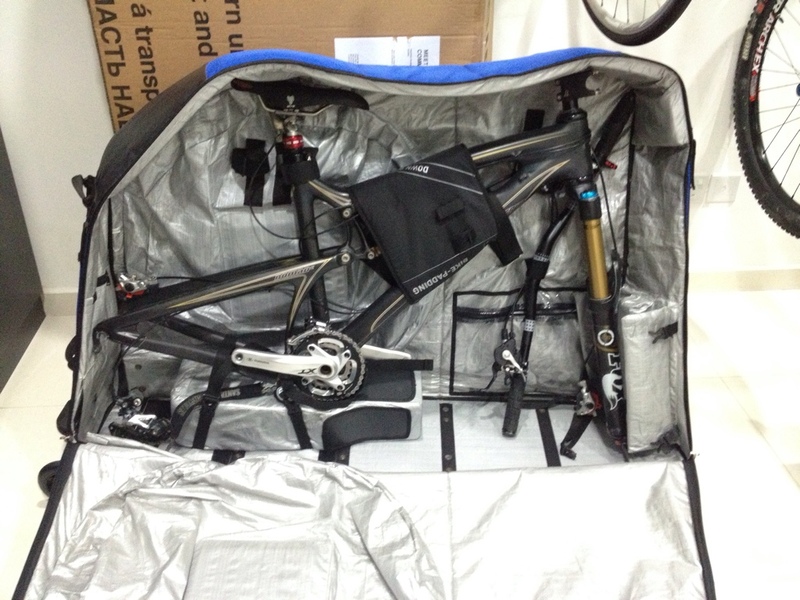 I removed the pedals and loose components to reduce total weight of EVOC bike bag to 23kg. The weighing machine besides this customer service desk was apparently faulty, as all our luggage were grossly overweight. Refused to listen to our explanation, this customer officer insisted that we must remove the items from all our luggage. I told her we were willing to pay overweight charges but she refused and insisted we remove the items. When she knew that I was carrying bike bag, she said that sport equipment were not allowed on the plane! What kind of crap excuse is this when the main social activities in this country are sports and outdoor activities? In fact, we met a passenger on the same flight who brought along a bike bag that weight over 30kg, way above the airline legal limit. When I met the same guy in Queenstown Skyline Bike Park, he told me that he did not encounter any problem with the check-in. What a double standard! Fortunately, another customer officer approached us and we proceeded to weigh all our luggage again on another weighing machine. Fortunately, all our luggage were within the airline legal limit, including my EVOC bag. Moral of the story, avoid Air New Zealand if you could unless the price is too low to resist. If you must, use the self-check-in machine as the Air New Zealand customer officer would not want to be disturbed. Otherwise, she will give you hell! I mean HELL!!! 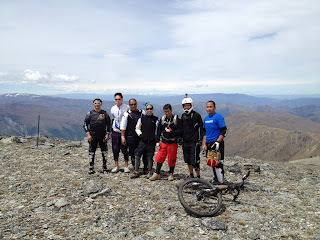 We arrived at Queenstown on December 12th. Hock Wee (Photo left) who arrived much earlier was kind enough to sacrifice the Skipper Canyon Ride to accompany me for a ride in Queenstown Skyline Bike Park. Hock Wee had many runs before I joined him. He was a skillful, patient and joyous riders. I was honored to be his riding buddy, as he guided me along those scary ball-dropping downhill tracks. 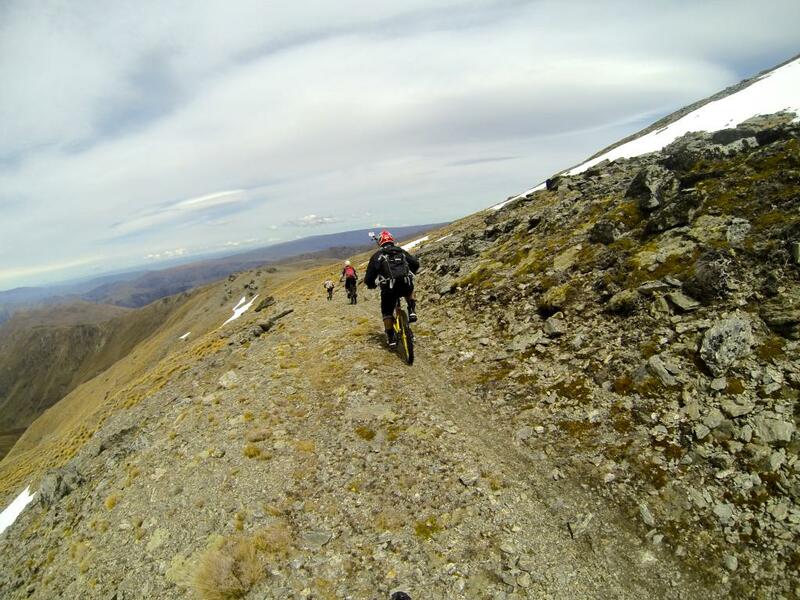 The prices for mountain biking are: half-day pass NZ$55 (10am to 2pm or 2pm to 6pm), day-pass NZ$75 (10am until close), 3-day pass NZ$175, season-pass NZ$629 (29Sep to 29Apr), and half-season NZ$499 (7Jan to 29Apr). 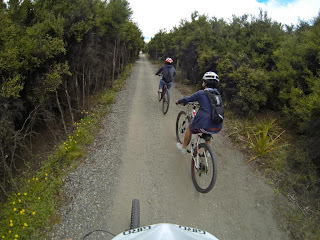 As we rode in the afternoon, we paid NZ$55 each for half-day ride. For the first run, we took the easy Hammy Track (Grade 2: Green) to warm up. 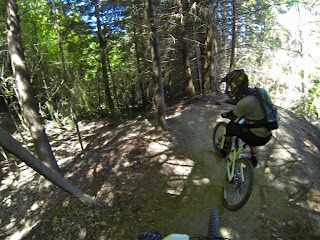 It was awesomely flowy and fun (too easy for my pro Hock Wee!). 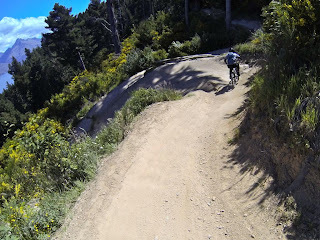 As it was my first downhill ride in professional tracks, I was cautious not to injure myself. I was surprised that the tires sticked to the ground like magnet, even on those tight switchback and berms. 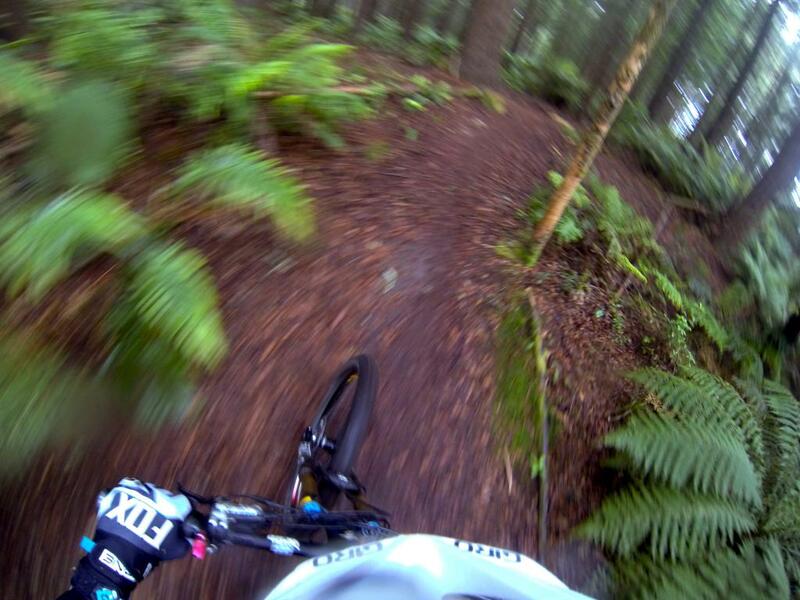 Could it be the soil, track design, speed, elevation or combination of all? My confidence was greatly boosted after the first run. Knowing that I was ok with the Hammy Track, Hock Wee brought me to the Hammy Links (Grade 3: Blue). It was more sloppy than the Hammy Track, the rest seems to be the same. I could tell Hock Wee was pretty bored with the easy track, but they were awesomely exciting to me. I was surprised my Nomad could do all those stuffs. Happy to finally enjoy the full potential of my bike! In our third run, we proceeded to Vertigo (Grade 3: Blue). I could see Hock Wee was getting excited. It is more challenging: with many tight switchback; large berm for wall ride and option for jumps. Vertigo was Hock Wee favorite, I 'cautiously' enjoyed it too! By then, my two index fingers were tired, as my brake levels were not adjusted for downhill ride. The brake levels should have been adjusted as close to the handle bar as possible. 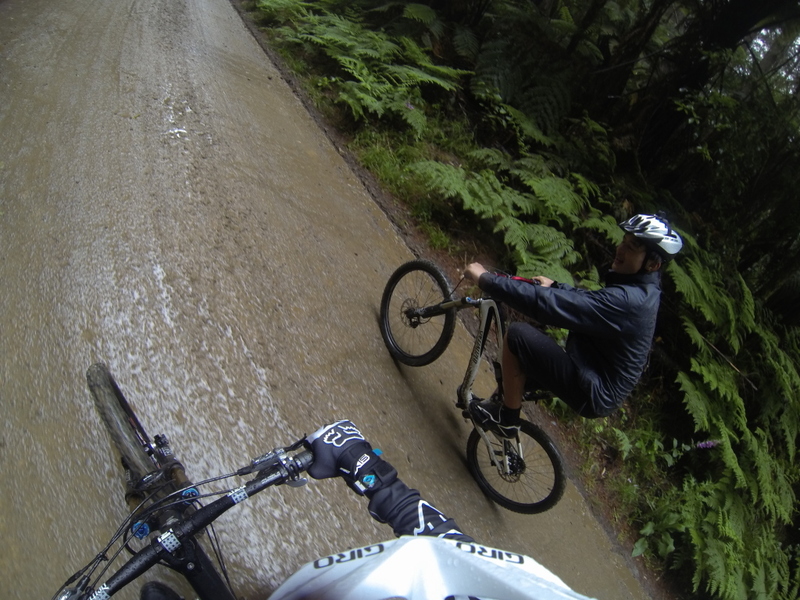 Hock Wee was just about to do the vertical descent, while I was following 'cautiously' behind him. Only one word can describe the experience...awesome! 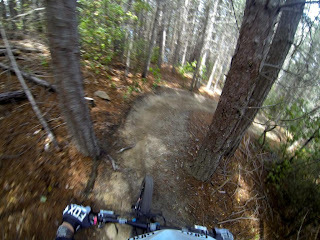 Knowing that I could handle Vertigo, Hock brought me to Single Track Sandwich (Grade 5: Black). He was very excited about it, but my heart was beating like crazy. 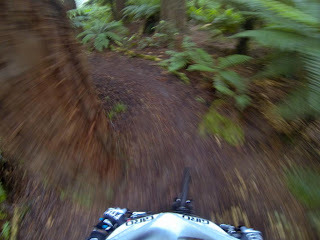 On our way to Single Track Sandwich, I crashed on the tight S-shape double switchback along the Vertigo track. I had done it before, but too complacent to anticipate the second berm and too late to re-position my body. I instinctively rolled over, damaged only my helmet visor. 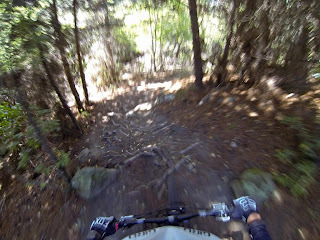 I stood up immediately and proceeded to The Single Track Sandwich. 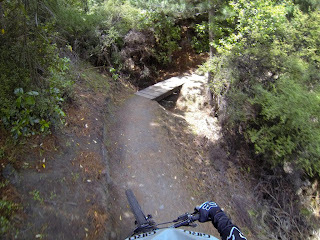 There were big jumps which I dare not attempt. 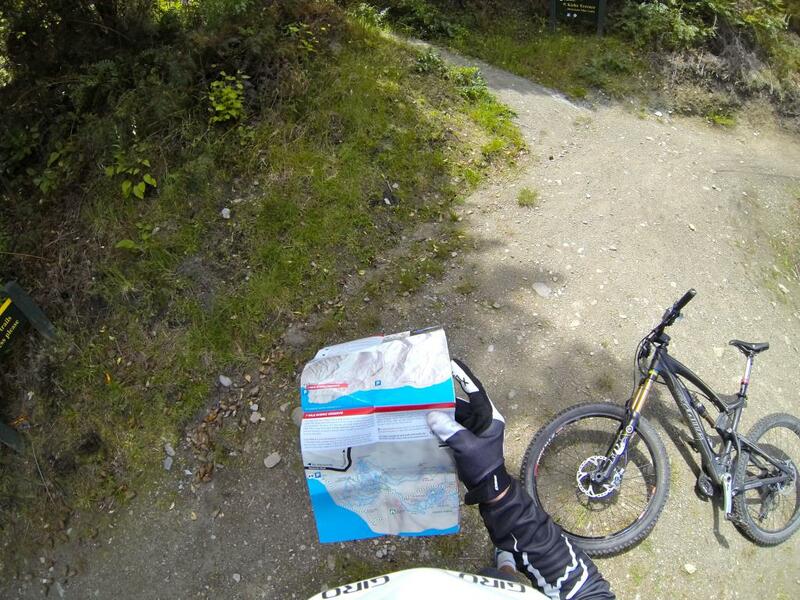 Fortunately, I cleared the Single Track Sandwich without drama! It was sweet and awesome. I was grateful to Hock Wee for been patient and willingness to share his experience. He is an awesome riding buddy! After the 4th run, I decided to call it a day. Perhaps, it was due to the earlier crash and my tired index fingers. Perhaps, it was due to my family, whom I might not be able to bring them around if I injured badly. Perhaps, I would have continued if my family was not with me during this trip. I did enjoy myself very much, and felt a sense of achievement for what I was capable of doing. I was grateful to Hock Wee for his precious time, patient and guidance. 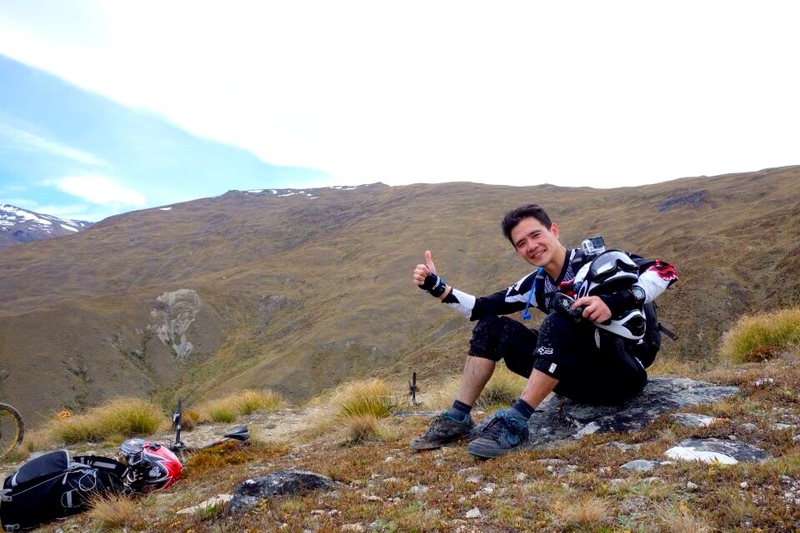 He is indeed an awesome ridding buddy! I met this guy during our flight from Auckland to Queenstown. 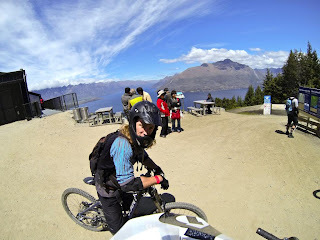 I met him again in Queenstown Skyline Bike Park. 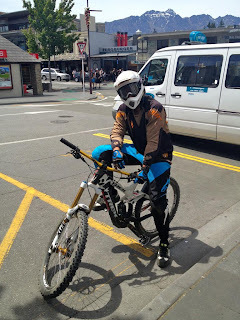 He was awesomely skillful, and rode like a pro. He was riding a Giant all-mountain bike. 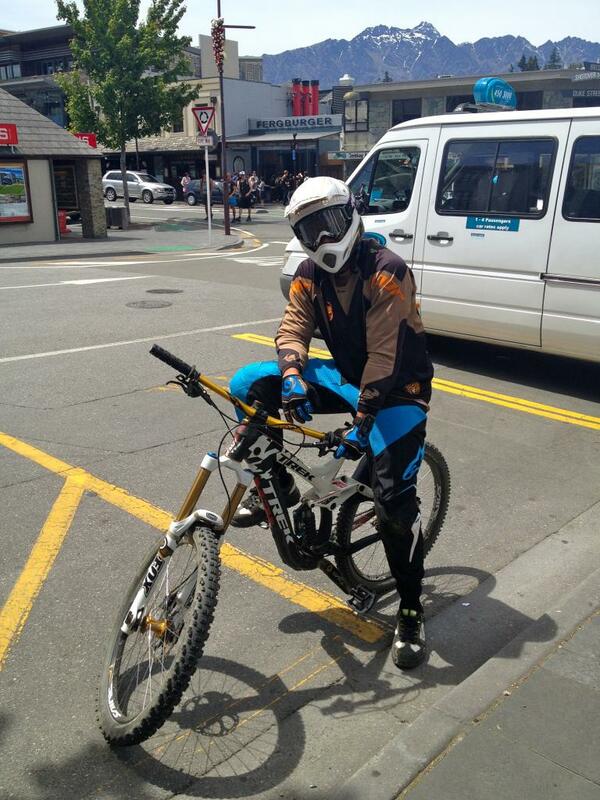 He rode alone and offered me to join him for a ride in Hunua Regional Ranges when we got back to Auckland. As my schedule was pretty tight, I missed the chance of riding with a pro! Queenstown Skyline Bike Park MUST be included in your riding plan if you go South Island. There were many skillful local riders who rode freeride bikes, though you would enjoy more with downhill bike. 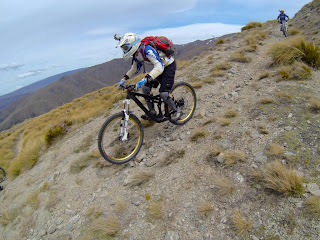 Although I was an average rider, my 160mm all-mountain bike was sufficient to handle blue grade tracks and enjoy the ride. 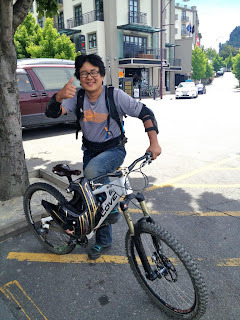 I was happy that my Nomad was able to handle the black grade Single Track Sandwich, though I was more focus on not crashing than enjoying the ride. I will definitely return with my Nomad and enjoy more black grade tracks in future! 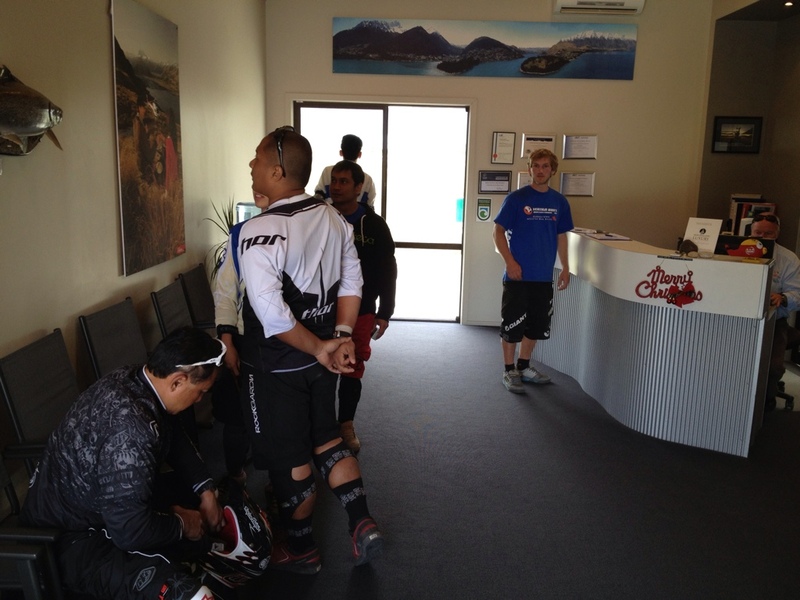 We assembled at VERTIGO BIKES shop at Queenstown central by 1pm to load up the bikes for the helicopter airfield. My idol Hock Wee sending us off to Heli-ride. I seriously hope he could join us...maybe another time. My idol Chie Hui and our number one rider in RnR! 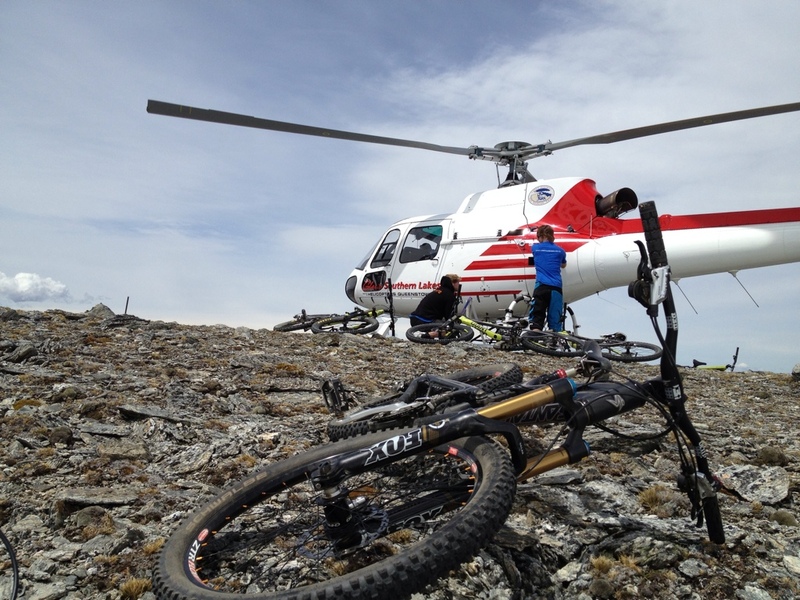 He too sent us off to Heli-ride. The Heli-ride might be too easy for him, but I wish he could join us for the experience! Upon arrival in the airfield, we took our weight and registered our names with the flight company. Based on our weight data, the pilot re-assigned the group and seating arrangement to optimize the flight load. We were brief on safety and waited in the room for the helicopter. As the group comprised of 10 persons including the 2 guides, the helicopter made 2 trips to the summit of Ben Cruachan. Those who took the first flight got the opportunity to hang around the summit for photo while waiting for the 2nd group. This group shot was taken just after the 2nd helicopter landed. I was so excited that I put on my full face helmet and got ready my bike before the rest even had the chance to settle down. This shot was taken just before we began the descent. Honestly, we did not know what is coming...the thrill of unknown really excited us. The first session is one of the most memorable event in my life. We did not expect to cross a steep snow cap at the top of the mountain! It was a scary and physically challenging experience. The slope was very steep, certain snow session could reached your waist. 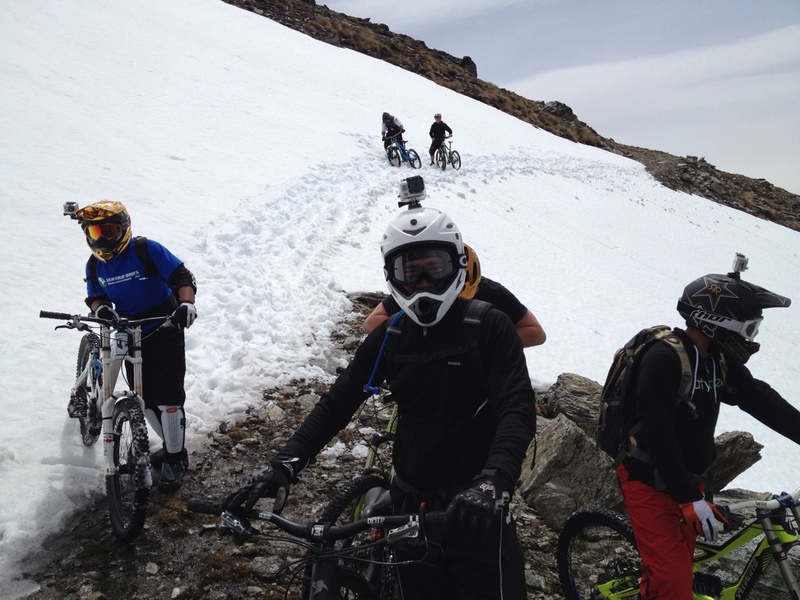 The trick is to position your bike at the lower side of the slope, and slowly push the bike across the snow. The thought of rolling down the mountain with my bike is real! To prevent that from happen, focus your sight at the destination and follow the foot steps of those in front of you. After I crossed the snow session. 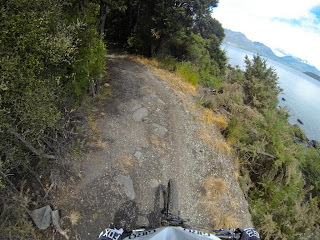 The ride was full of loose rocks, which made the ride a bit dangerous along the cliff and steep slope. 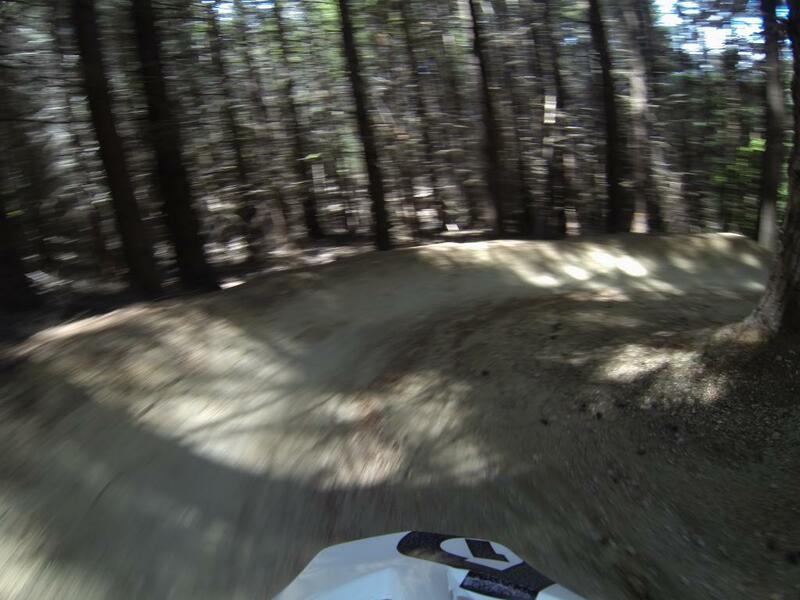 This shot was taken by GoPro3 Black attached to my helmet. It was set to take one shot every 30 seconds. This section of trails were along a stretch of deadly cliff, curving around the contour of the mountains. 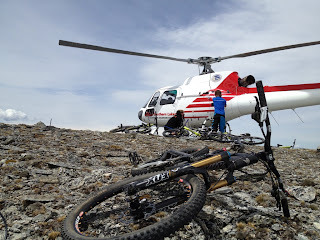 Such experience could only be seen on MTB movies, didn't expect I got the chance to experience it! Chee Mum overtook me after he recovered from oxygen deficiency caused by high altitude. Chee Mum is an awesome rider. I was unable to catch up with him. He would stop way beyond us and got down his bike to shoot our rides as we descent! Debby in descent action! 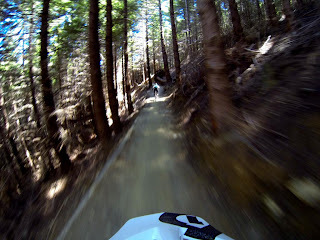 This shot was 'accidently' shot by my GoPro3 Black as it was set to shoot still photo every 30 seconds. I was actually resting and enjoying the view as she rode passed me. 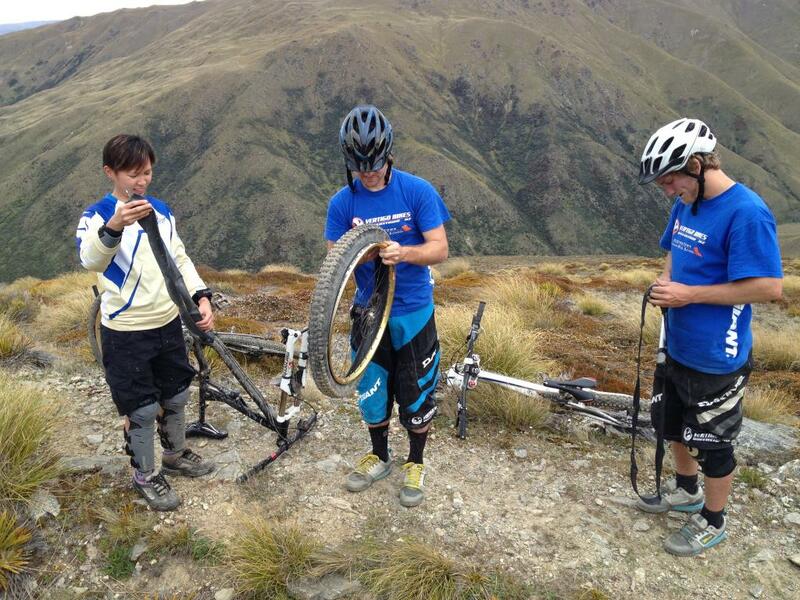 The VERTIGO folks were fixing Debby's punctured tire. These 2 guys carried the biggest and heaviest bags you could imagine. The bags contained a mini-workshop, cookies for all of us, and safety box. Very professional and excellent service. Highly recommended! 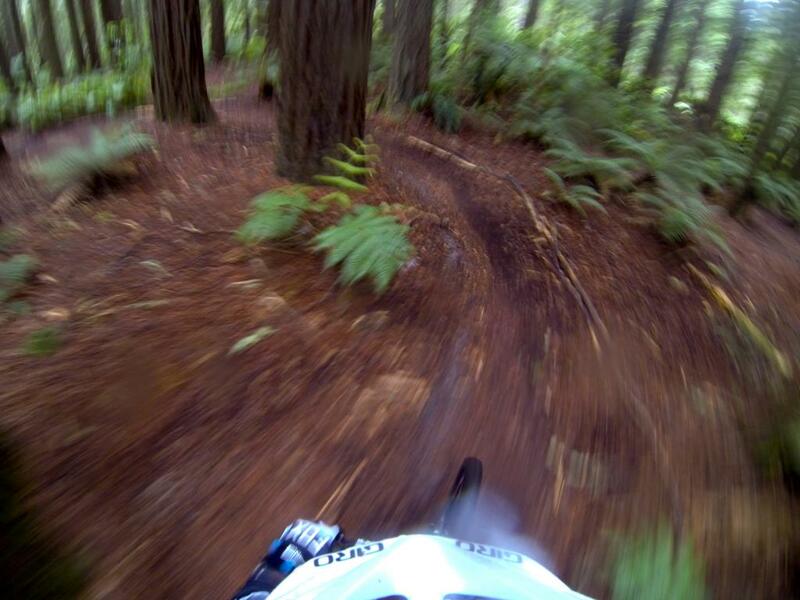 This shot was accidentally taken by my Gopro. Beauty! We were near finishing line. The finishing line was mainly loose gravel tracks. This shot was taken by Chee Mum. He got down his bike way ahead of us to take this shot as we did our last descent. 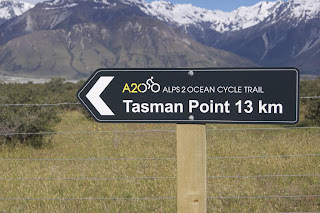 The end point along the Gibbston Valley vineyards. The truck was waiting to ferry us back to the bike shop. Heli-ride is the most memorable experience I had so far. Super, super, super awesome! The experience worths every penny we spent. Go for it if you could, I assure you will not regret. 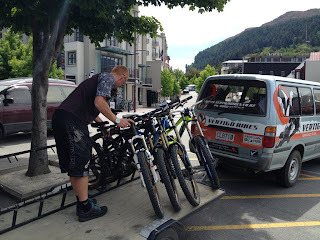 Look for VERTIGO BIKES in Queenstown. MUST DO!!! 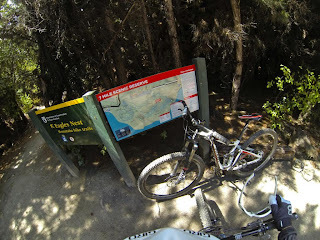 My initial plan for 18th December 2012 was to go for Skipper Canyon ride. 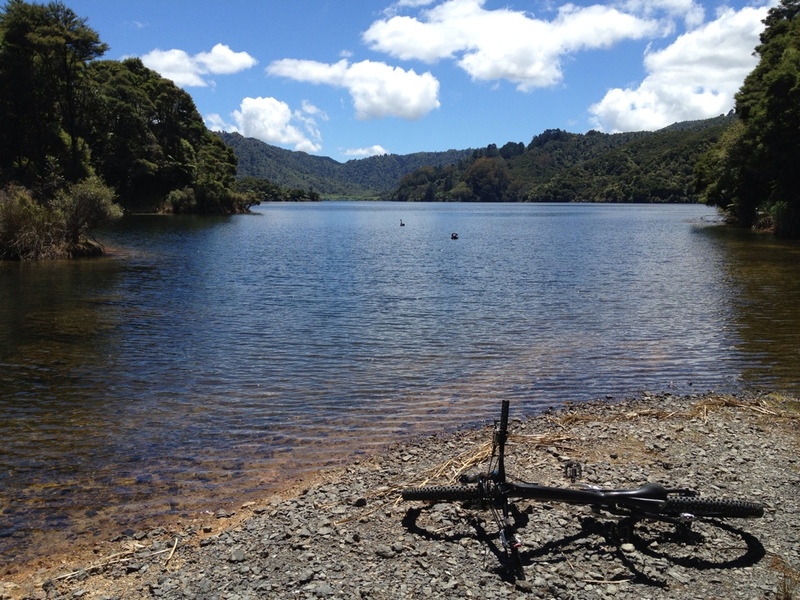 However, I was unable to gather minimum of 4 persons and decided to go for solo ride at 7 Mile Scenic Reserve. A decision that I was glad to make. 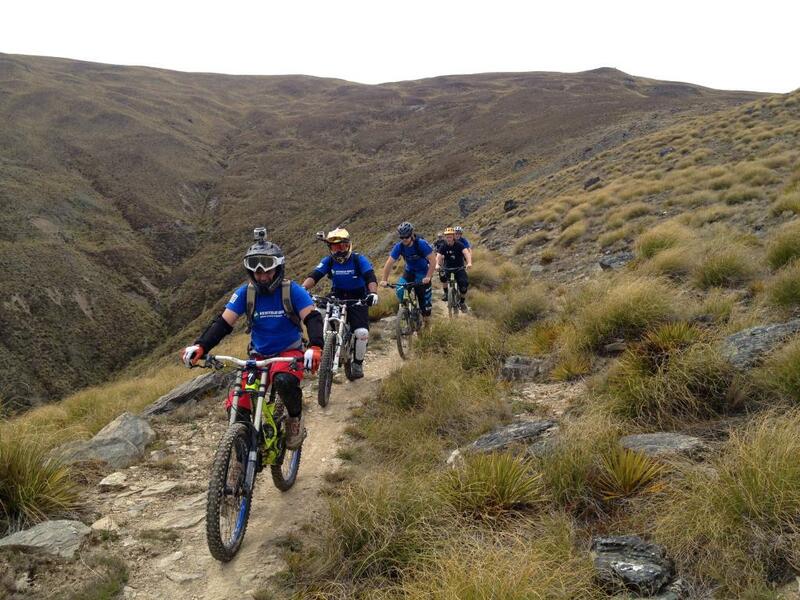 The MTB trails comprise of 13 MTB trails, ranging from Blue 3 grade to Black 5 grade. 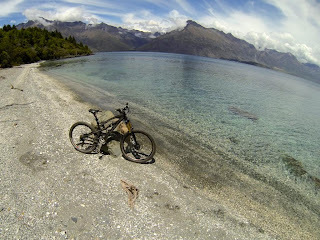 As I started from my Motel at Queenstown city centre, I rode about 6km on and off road to enter the 7 Mile tracks from Glenorchy Road car park. 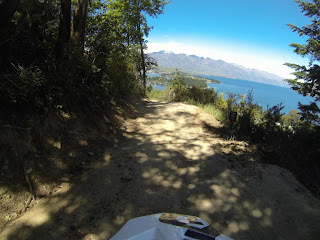 As I entered the off-road towards Glenorchy car park, I was greeted with this narrow and steep rock garden along a stretch of high cliff. 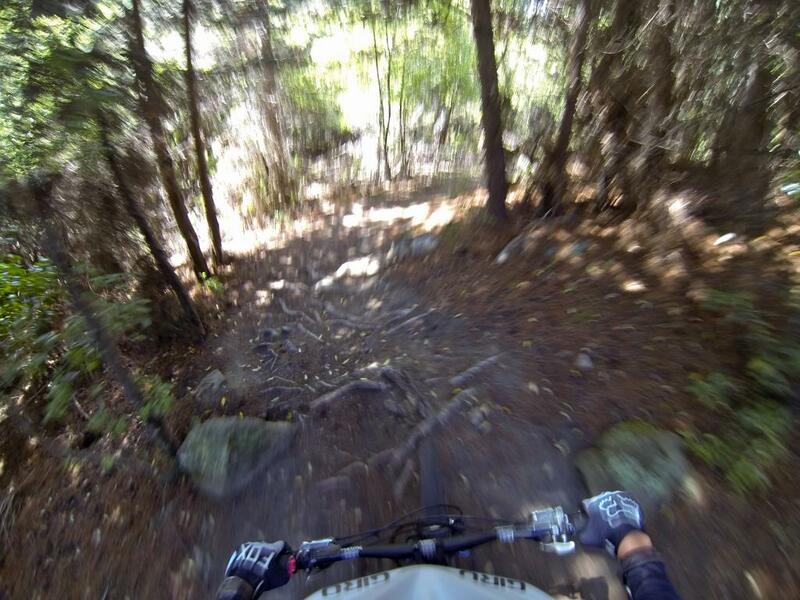 There was a tight switchback that was not captured by my GoPro. It was pretty scary for first timer. This is the dual way rocky slope. I doubt the wooden fence will help to make you feel safer. I think it serves little purpose if you endo over the bar...most probably you will fall off the cliff. To play safe, go slow. 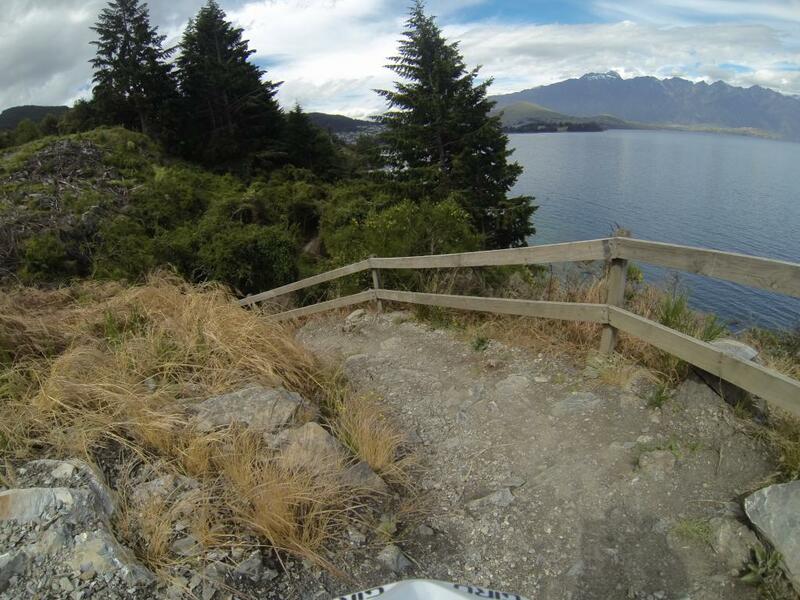 After the climb, you would cross this narrow wooden bridge towards the trails. Honestly, I did not realize the scenic view until I saw this photo. As first timer, I was more concern of not fallen off the cliff than enjoy the scenic view. This is the entry point from Glenorchy Road car park into the 7 Mile tracks. 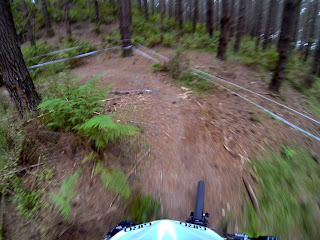 The dual use track was flowy and easy to ride. I felt my Nomad was floating down the trails...the feeling was awesome! 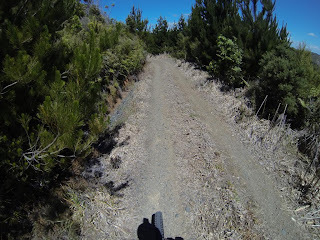 As I bombed down the dual use track towards the mountain bike trails, I nearly hit a cyclist who was rolling slowly towards me. 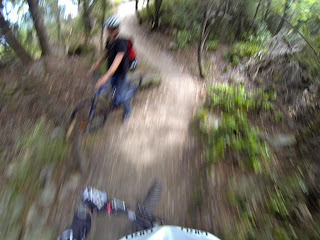 Fortunately both of us turned the opposite direction to avoid a potential nasty crash. Another deadly cliff trail. I were quite slow along this section. I would certainly stop at Y-junction if they were new to me. Hate to decide between two trails, especially one uphill and the other downhill. 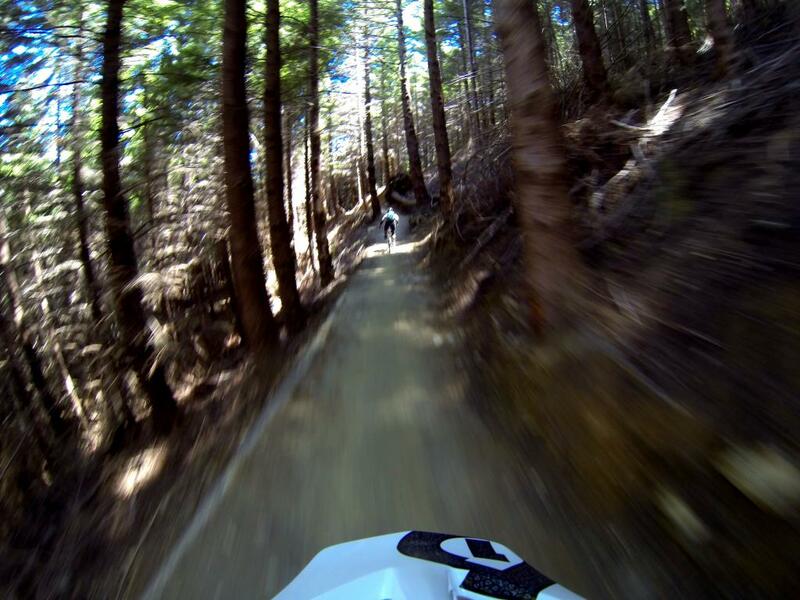 If someone was behind me, I would probably bomb downhill. If I were alone, I would climb uphill. Funny, isn't it? Nice flowy turn across a 3-foot long wooden bridge. I think the bridge was intended for all levels of riders. A gentle ramp for riders to jump over the gap would be nice. This steep and rooty downhill section is pretty awesome. Having warmed up my DH skill at Queenstown Skyline Bike Park did help to tackle this section. Awesome! Saw this cool Giant bike as I was looking at the map. 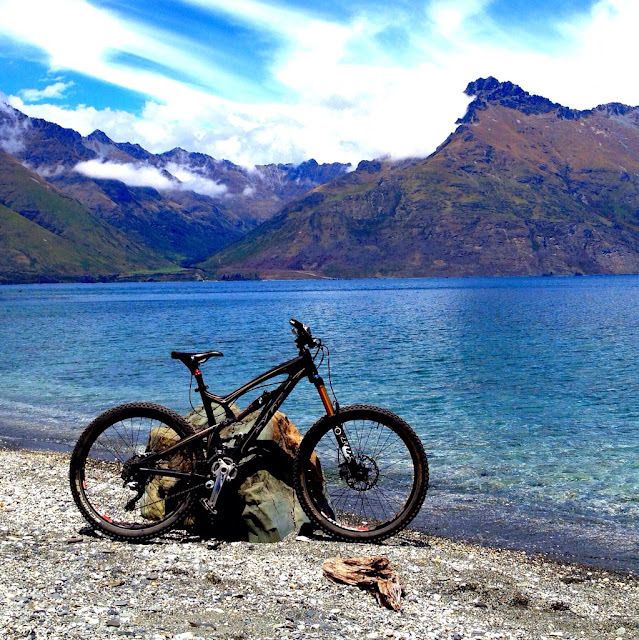 Guess who rode this freeride setup bike? Yes, a girl! Decision again, up or down? Hate to stop the flow...Maybe I was in the opposite direction? 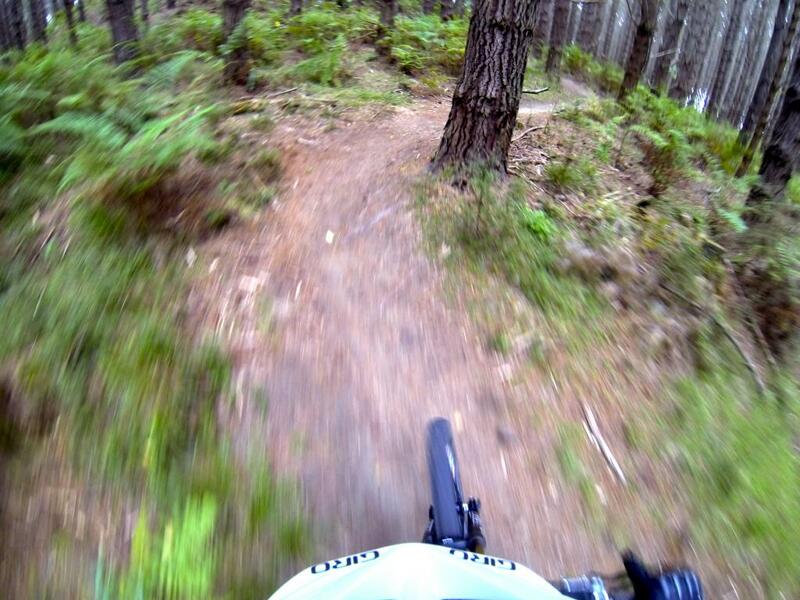 The trails were more suitable for XC bike with short handle bar. My 760mm handle bar is too wide for some of the trails in 7 mile. I managed to 'squeeze' through these 2 trees. Reward yourself by dipping into the lake. I did not do it, the water was too cold! 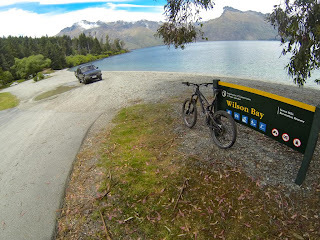 This is Wilson Bay, the end point (or start point) of the 7 Mile Scenic Tracks. 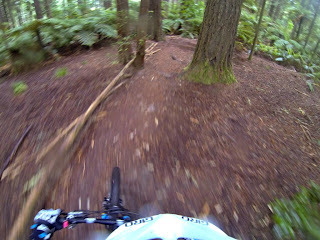 The 7 mile scenic reserve was best ride with XC bike, as there were substantial technical climb with tight switch back. I did not get to ride all the trails as time was not on my side. 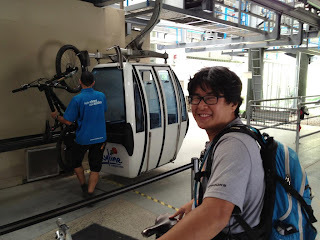 The trails were flowy, with technical climb that could not be experienced in Singapore. 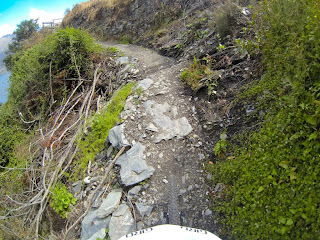 There were downhill sections with loosely packed rocks and tight switchback. Good for practicing technical skill. Will definitely come back for more! When I was in Singapore, I got the news from Facebook that some of the mountain bike trails in Woodhill bike park were flooded by stormy rain and tornado. 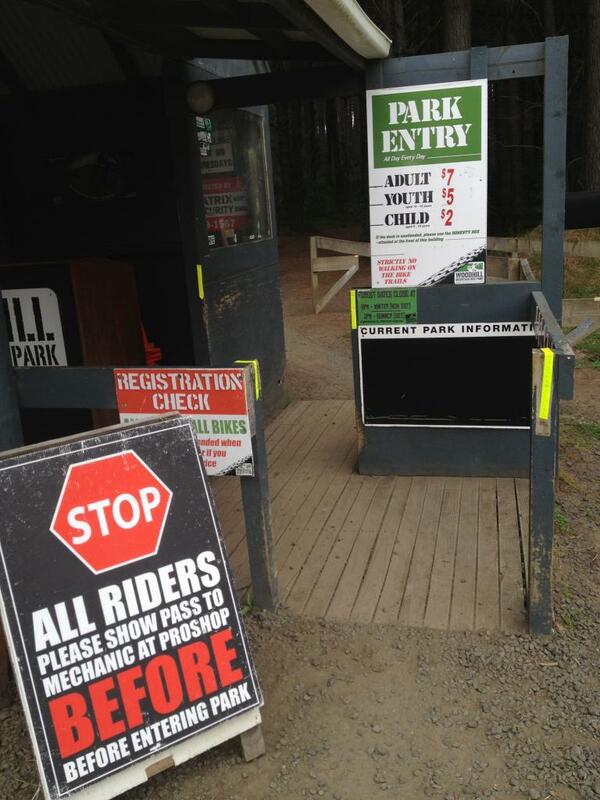 Fortunately the bike park was opened by the time I got there. 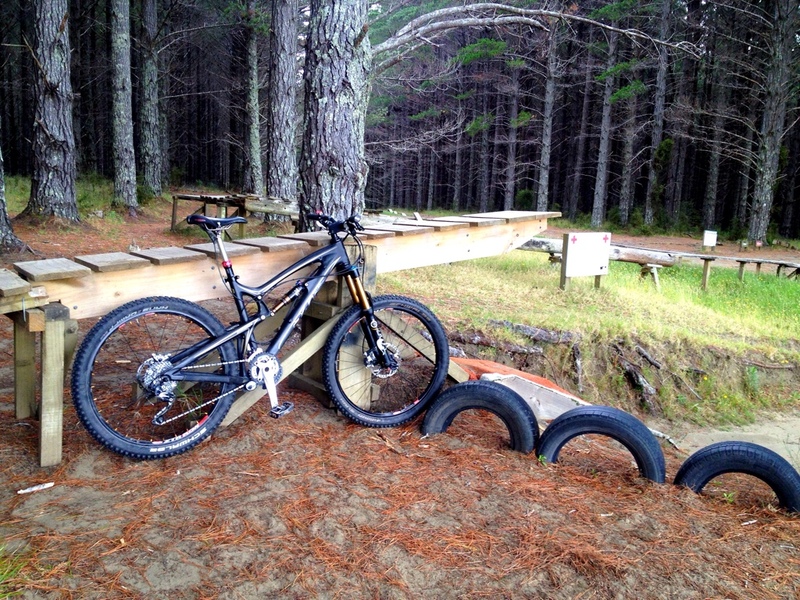 Woodhill bike parked is located North of Auckland, about one hour drive from Auckland city centre. 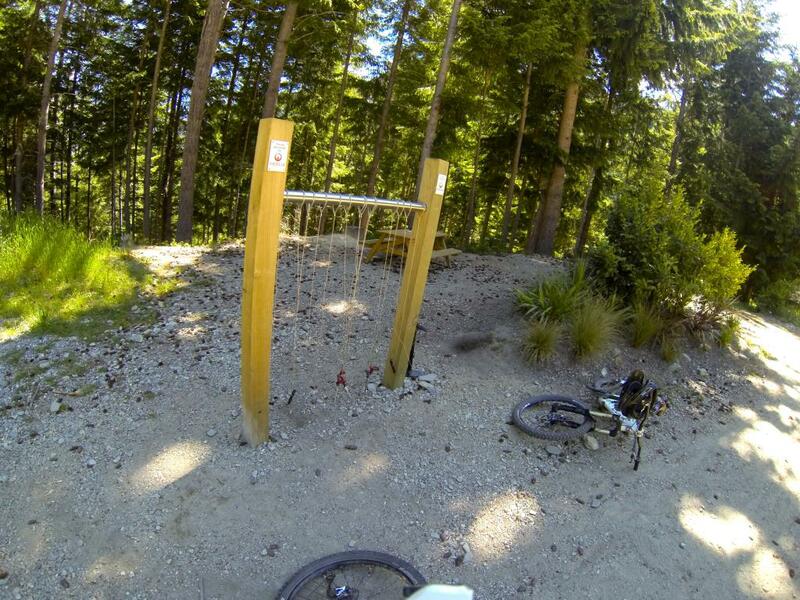 The bike park comprised of about 130km of man-made mountain bike single track with more than 200 features for you to practice and show-off your skills. As Auckland does not experience snow (except hail) during winter, Woodhill bike park opened all year round. The bike park facilities include a Bike Shop (sell apparels/components, bike servicing and bike rental), Monster Energy Airfiled where you can do all those big jump and a drink station. 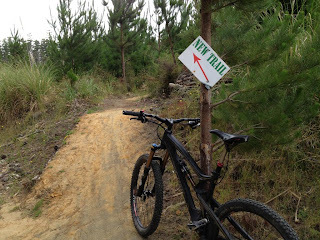 The mountain bike trails opened from 7am to 6pm. 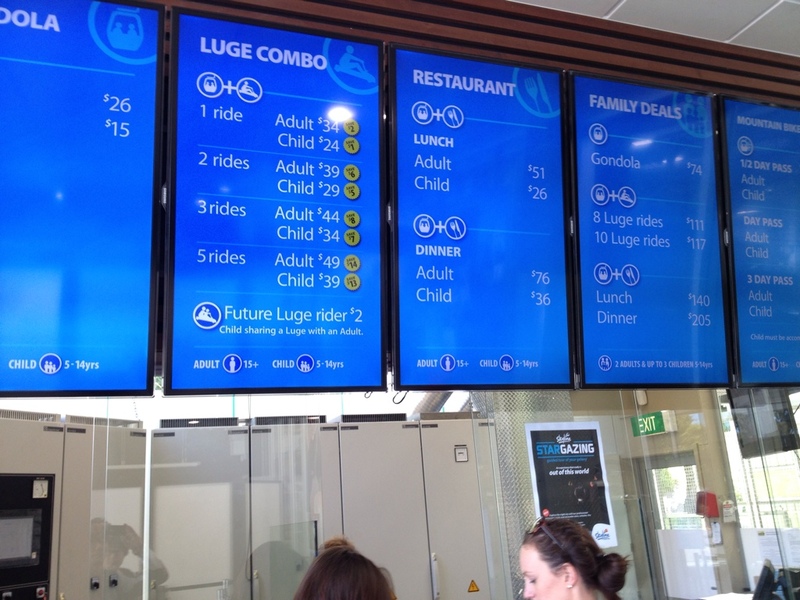 Day pass cost NZ$7 per day; NZ$35 for 6 days pass; NZ$70 for 6 months pass; and NZ$107 for 12 months pass. 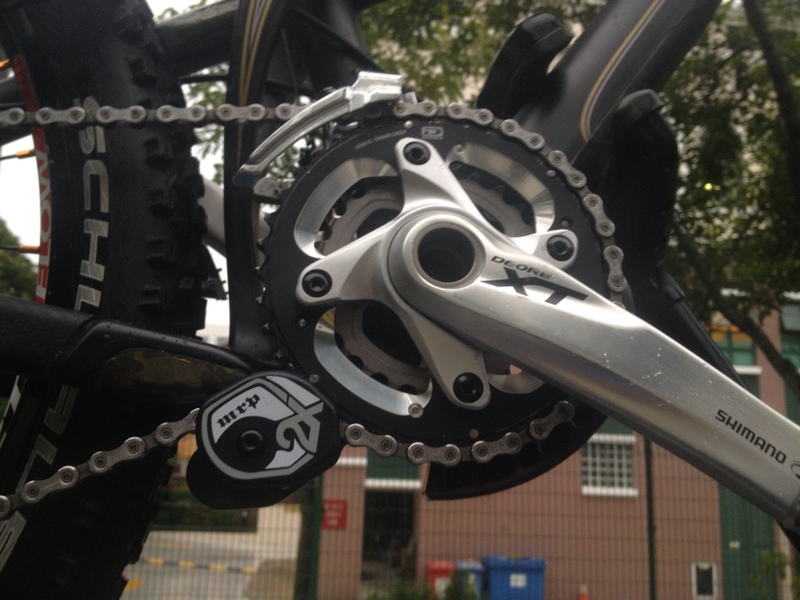 If you did not see any staff in the bike shop, there is a honesty system where you drop the pass fee into the box. The photo illustrates the entry point into the mountain bike trails. 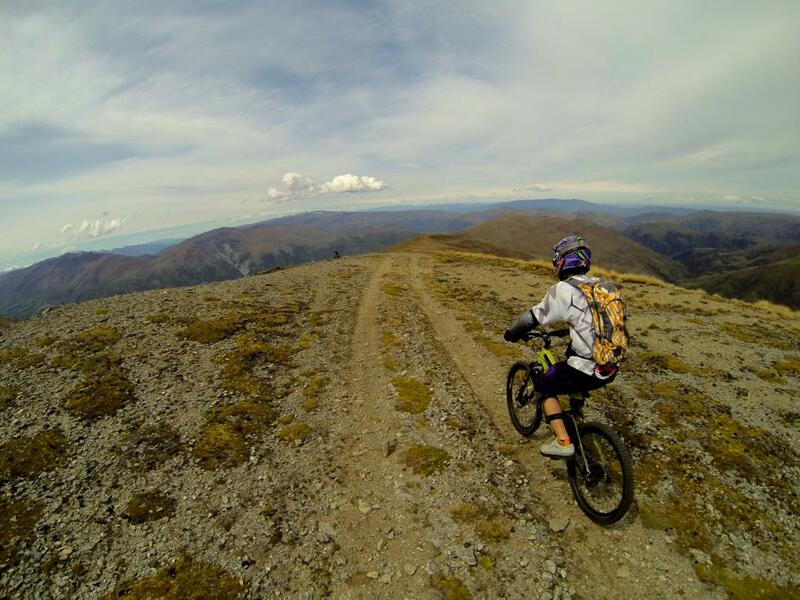 There were 68 distinctive mountain bike trails with different grades and experiences. The grading system starts from one X (easy) to 5X (extreme). I was comfortable up to 3X, and selective on 4X. My skill (or balls!) was insufficient for 5X, not for faint heart riders. 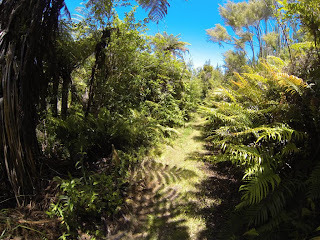 You will not lost in these trails, they were easy to navigate as the forest was not as big and dense as Rotorua. In addition, commercial bike park does not have illegal trails so navigation is easy. Since the Woodhill Bike Park was commercially run, almost all the trails were sponsored by private companies. 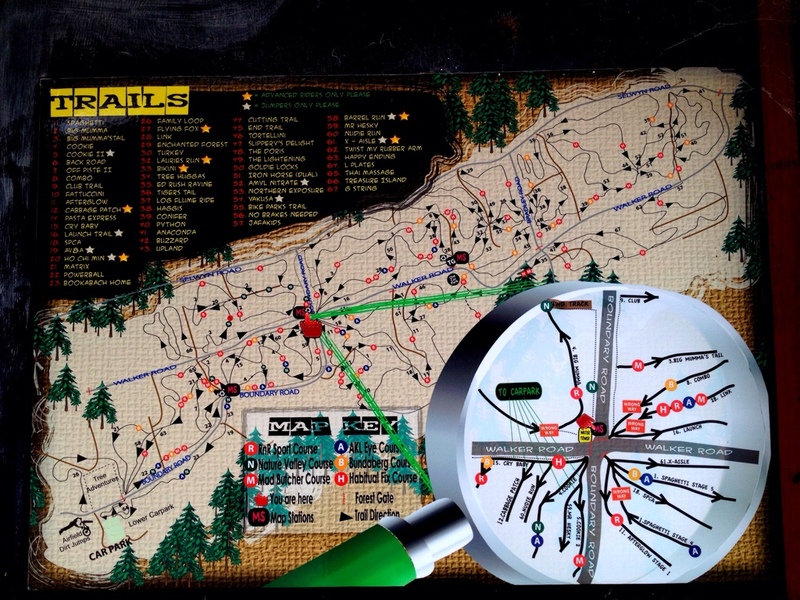 You would see companies' logos at the entry of each trails. 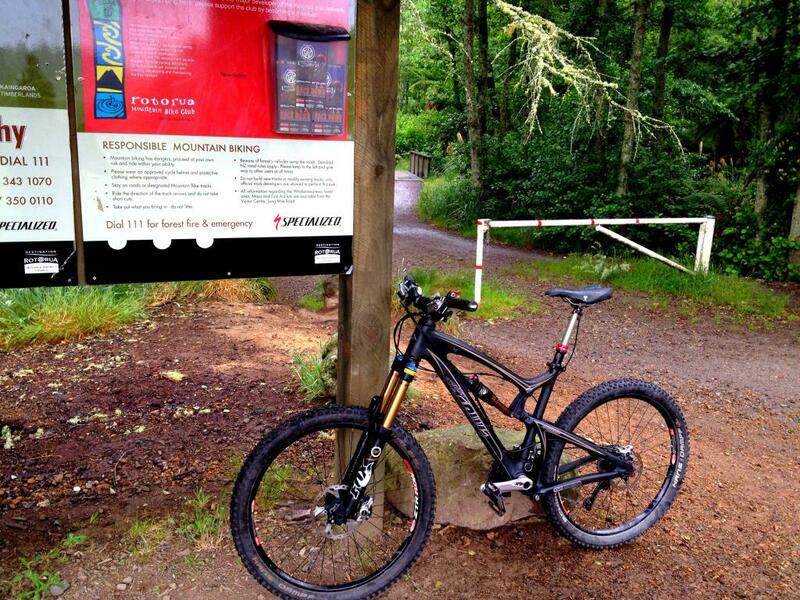 I think such concept could be adopted in Singapore to get funding for building more mountain bike trails for public. 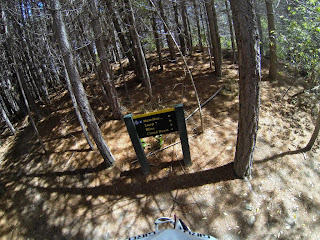 The trails were flowy, and the climbs were gentle as well. 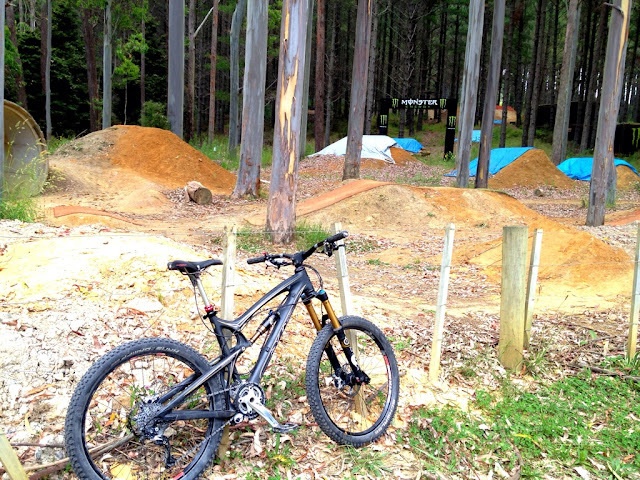 If you could ride comfortably in Bukit Timah trails, you should be able to manage the climb in Woodhill bike park. 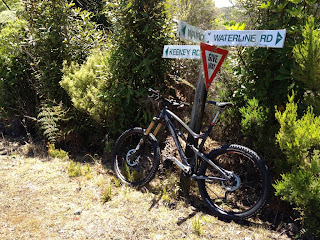 If you only have half day to ride, go for Mad Butcher (20km) and Habitual Fix (22km) trails. There were many features along the way, all came with chicken lines if you don't feel like taking the risk. Mad Butcher would be a nice warm up as the levels of difficulty progress as you move further. I came across this new trail which was not on the map. In my opinion, it is one of the best trails in Woodhill. 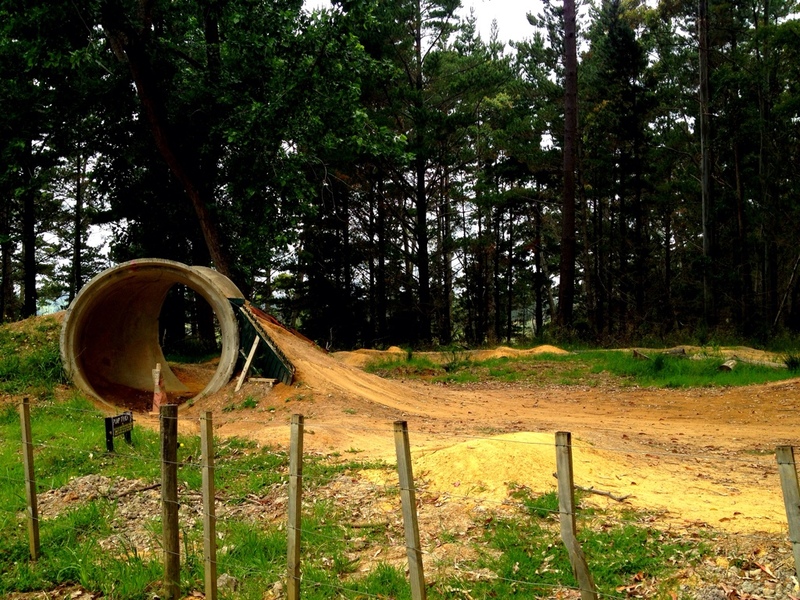 It is a very flowy and well designed pump track. 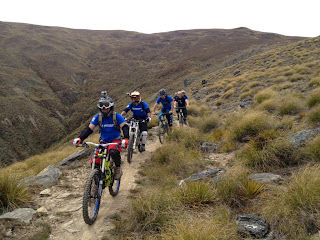 After the initial short climb, the rest are rolling, pumping and jumping all the way to the exit. 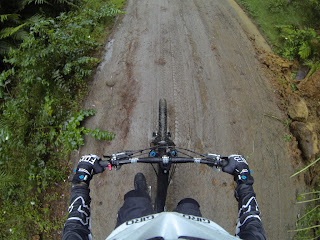 It was manageable for average rider like me, and heaven for skillful riders. Awesome! This is one of the features in the Monster Energy Airfield. I do not think I will ever attempt the stun! I only watch that in movies. Unfortunately, I don't get to watch anyone doing it. I could not remember where this trail was. 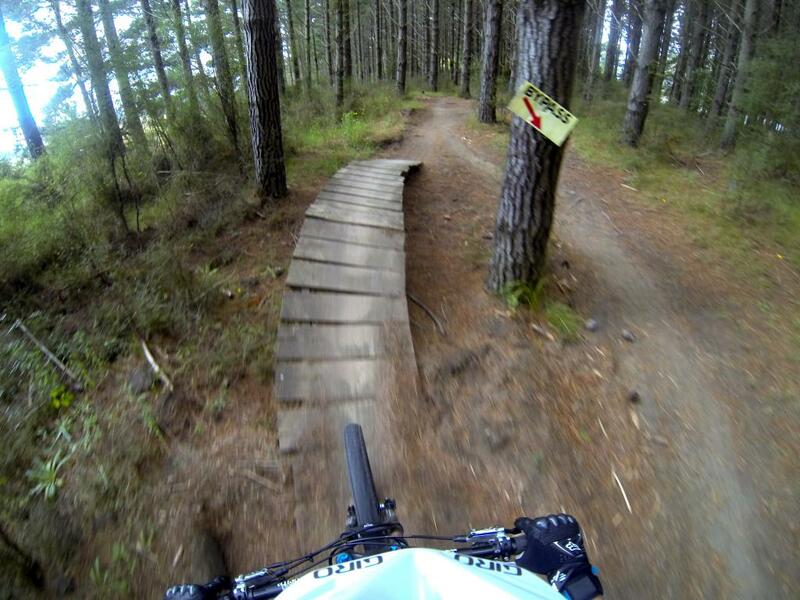 The photo demonstrates that the trails in Woodhill bike park were clearly marked and thoughtfully designed. The shop in front is the bike shop, while the one on the right is bike rentals and drink stall. Bikers would normally rest here after the ride. 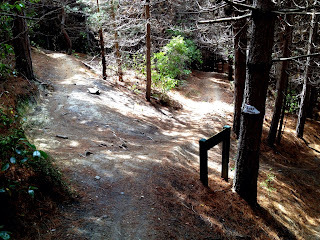 In my opinion, Woodhill would be an ideal bike park to practice your technical skills, as it provides all types of professionally constructed features that you could only dream of. 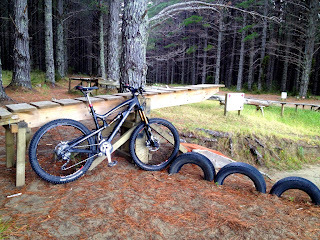 If you were looking for scenic ride and features created by nature, Woodhill may not be the one for you. 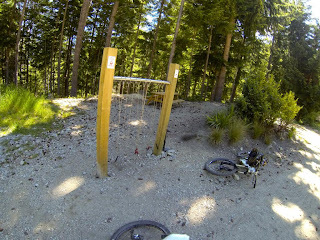 It was quite artificial and comparatively smaller than the rest of the bike park. However, in terms of trails' mileage it could be quite substantial as the trails were densely looped around the forest. 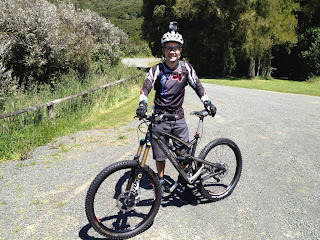 I came to know about Rotorua Bike Park while conducting research on Internet about mountain biking in New Zealand. It has received many good review, including my fellow riding mates in Singapore. 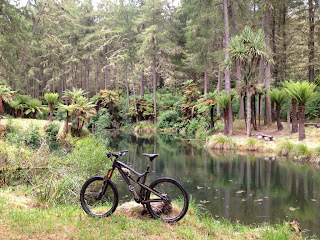 The Rotorua Bike Park in Whakarewarewa Forest is about 3 hours drive from Auckland. 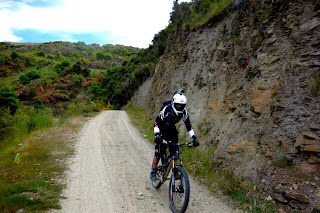 You could access the mountain bike trails from Waipa car park or Long Mile Road. 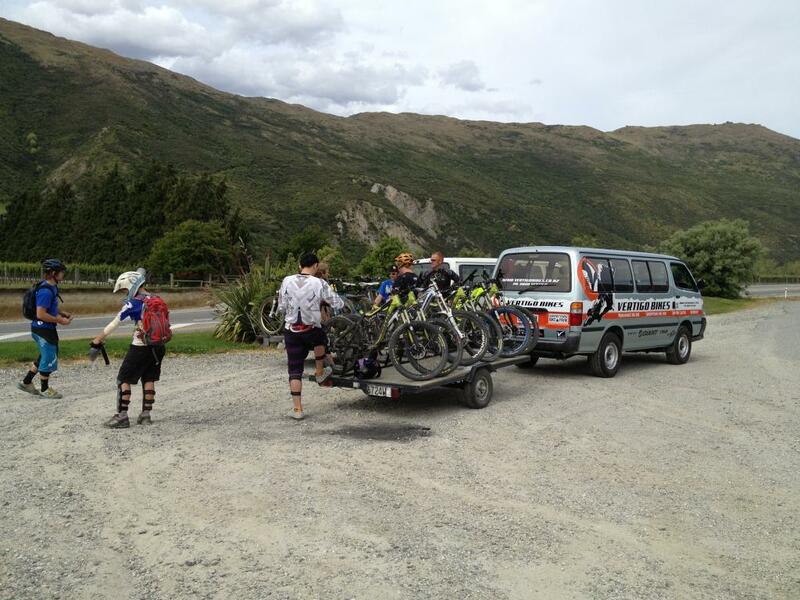 I would recommend Waipa Car park as the entry point, as the location are equipped with facilities such as bike washing bay, portable toilets, bike shop and cafe. 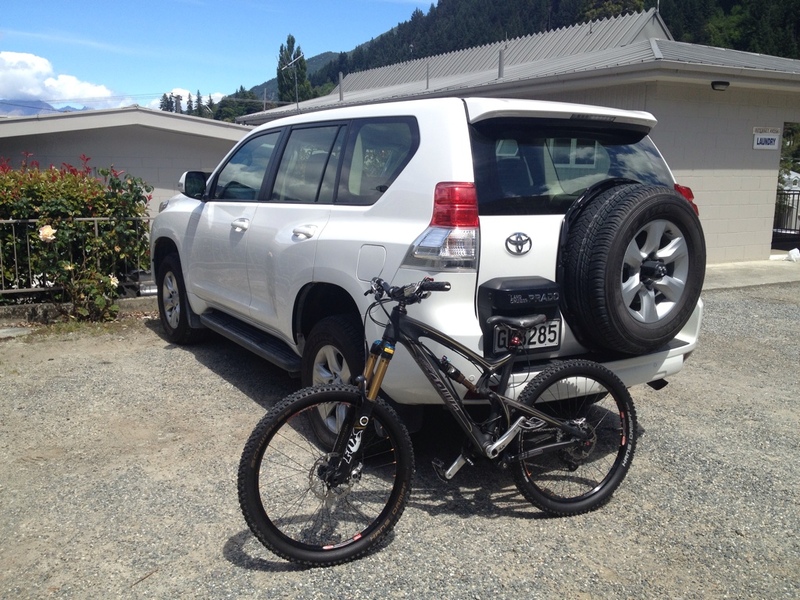 If you decided to stay in Rotorua, Alpin Motel on Sala Street would be the preferred choice as it is within short riding distance to Waipa car park. The operators of Alpin Motel are member of Rotorua Mountain Bike Club, and they provide bike storage and washing bay for mountain bikes too. 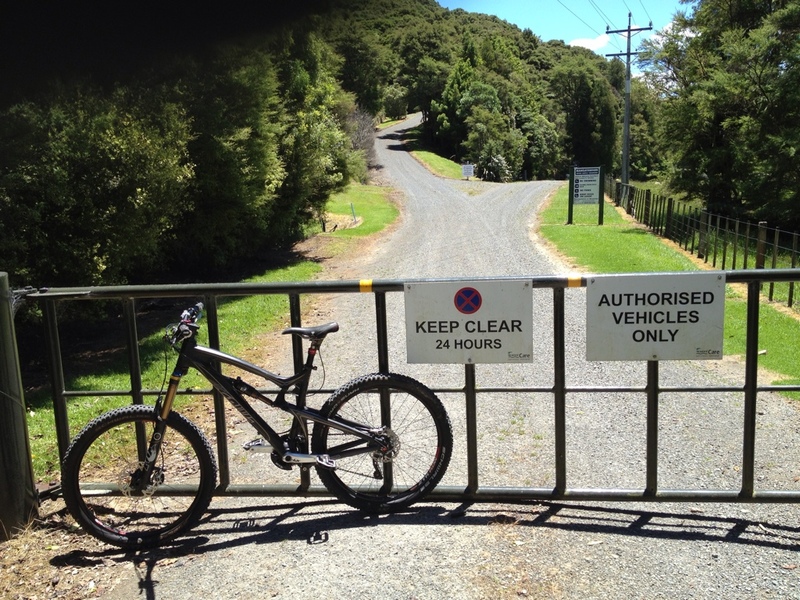 This is the entry from Waipa car park to the mountain bike trails. 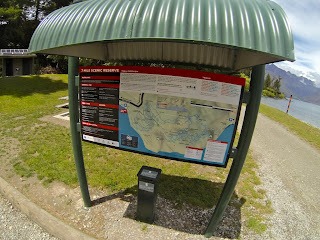 Although there are maps on the signboard of each checkpoint, first timer should purchase a map (NZ$5) from the bike shop located at the Waipa car park. 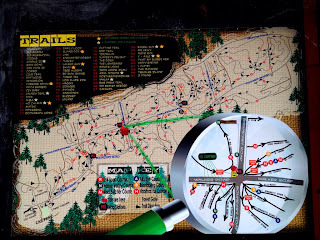 You would probably lost your way if you were unfamiliar with the trails. The friendly staff in the bike shop will guide you along. Remember to keep the map inside a plastic bag, as rain may wet the map beyond usage. It happened to me when the sky started to rain! 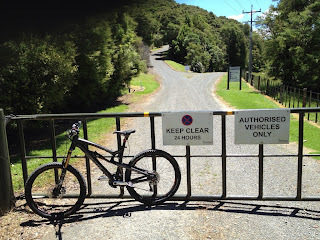 Once you entered the trails from Waipa car park, I took the trails on the right as recommended. 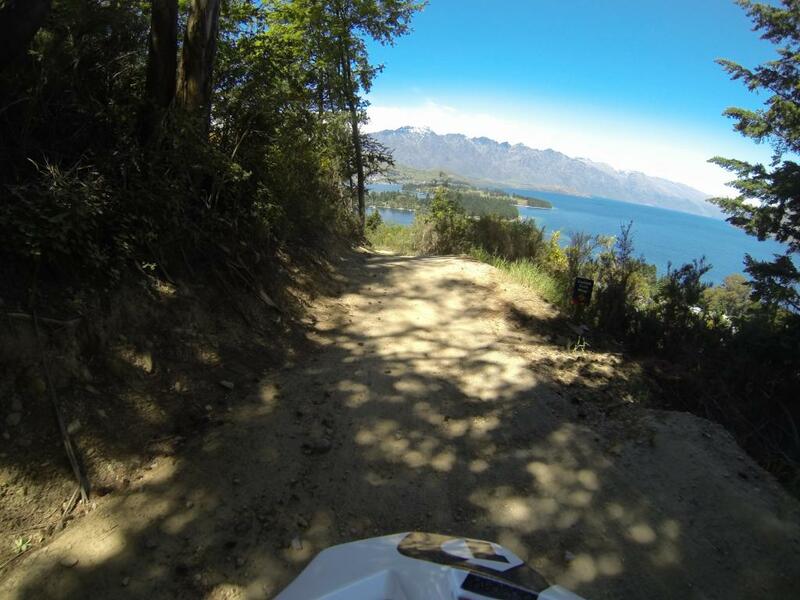 You have the option to ride different grades of trails along the way. All the trails were awesomely flowy and pleasant to ride. 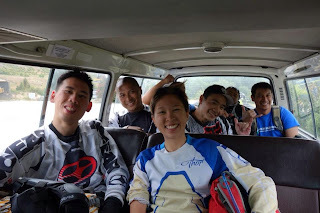 The tires sticked to the trails like magnet, and the confidence to take any berms and drops were greatly boosted. Don't remember where this trail is, I could not help but to stop and enjoyed the scenic view of streams and forest. It is heavenly! 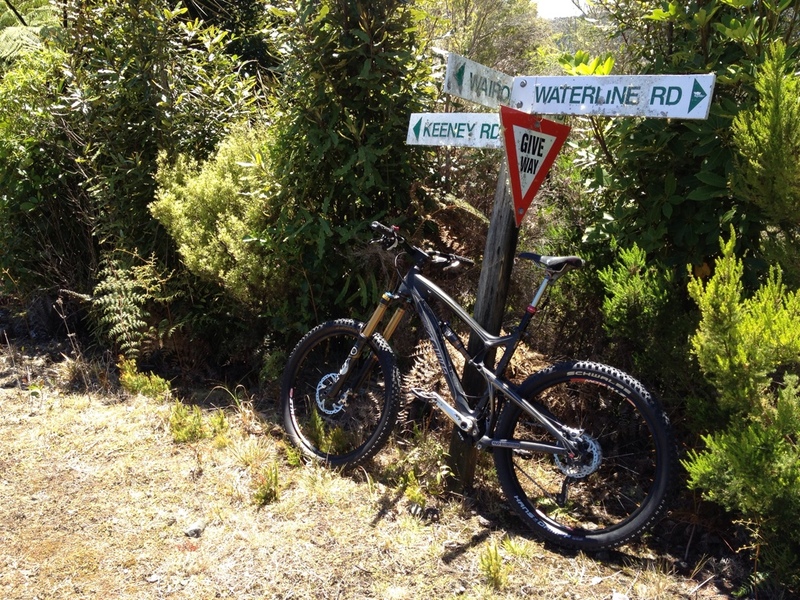 After a few runs in the trails, get on to Nusery Road and you will arrive at checkpoint 5. As it was raining quite heavily, my map were totally drenched and started to crack. 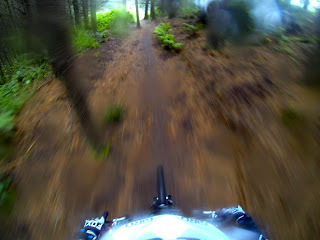 Refer to the photo, you could see rain water smearing over the lens of my GoPro. As I moved towards checkpoint 7 to catch the shuttle that would bring me and my bike to the peak, I continue to enjoy the trails as it came along. Although it was raining and I was totally drenched, I did not feel a bit of slipperiness on the trails. The feeling was awesome! When I finally arrived at checkpoint 7, a kiwi rider told me that last shuttle had just left. As it was raining heavily, the shuttle decided to stop service as the trails would be too slippery and dangerous to ride. Otherwise, a NZ$10 note would send you and your bike up the peak where you could roll down the world cup downhill section or the awesome Huckleberry houndback to checkpoint 7. We were very disappointed. 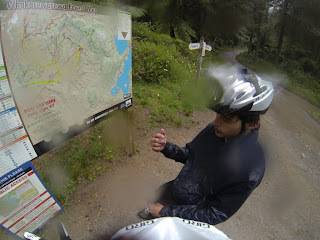 Refused to give up, both of us continue to pedal up the mountain as the rain kept pouring down. Before we reached the peak, the kiwi who rode a Specialized bike decided to divert into another trail, and I could see he looked worried. Ok, I finally u-turned back when I realized I was nowhere near the peak, and time was running out. I need to meet my wife at the car park by 3.30pm. It would take another 3 hours to drive back to Auckland. I would not want to be banned by her for life! The kiwi guy knew it, he is smarter than I! 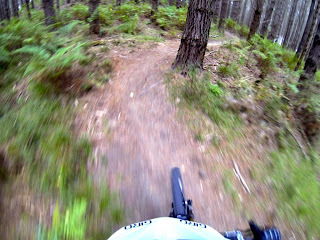 Not all effort were wasted, the trails down to the car park were pretty awesome. 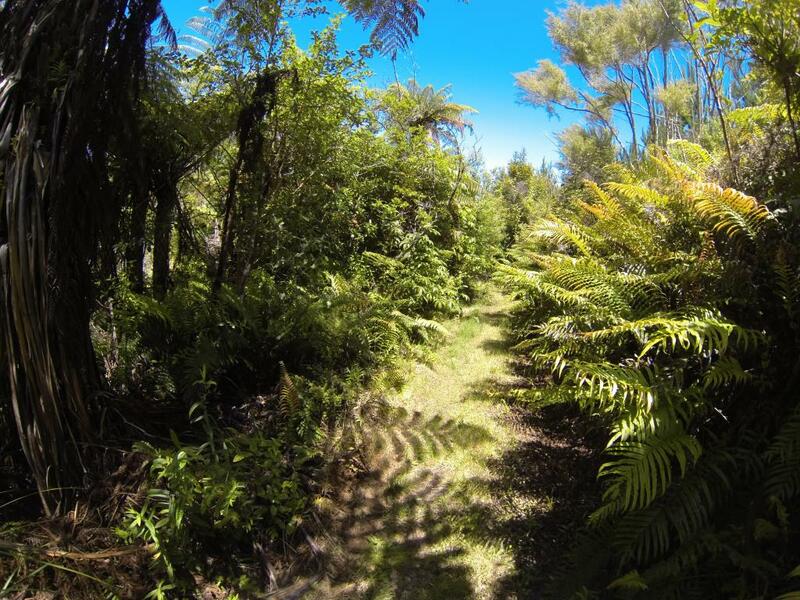 Lost in the forest while on my way to Waipa car park. It might not be a bad thing as I came across this heavenly view of the forest. It was somewhere near the water catchment area. I could actually camp here for a day just to have my eyes therapy. 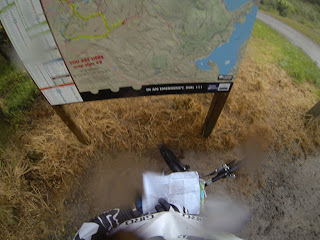 As my map was totally destructed, I took every opportunity to enter any bike trails that came along. As the guide said....as long as you go downhill you will reach the car park! 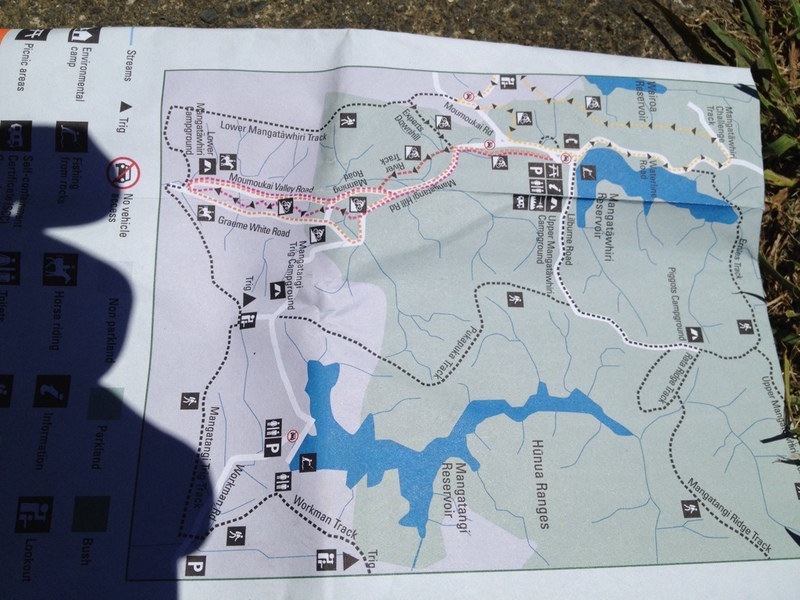 Finally, I was able to find my way out of the forest by 3.30pm. 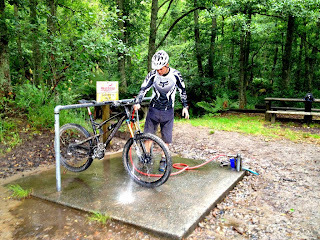 The bike washing bay was free of charge, and it came with brushes too! Awesome! 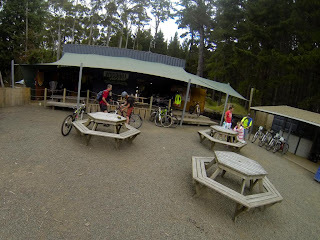 At the end of the ride, you could hang around the cafe to have a cup of coffee and enjoy the muffins. This is life! 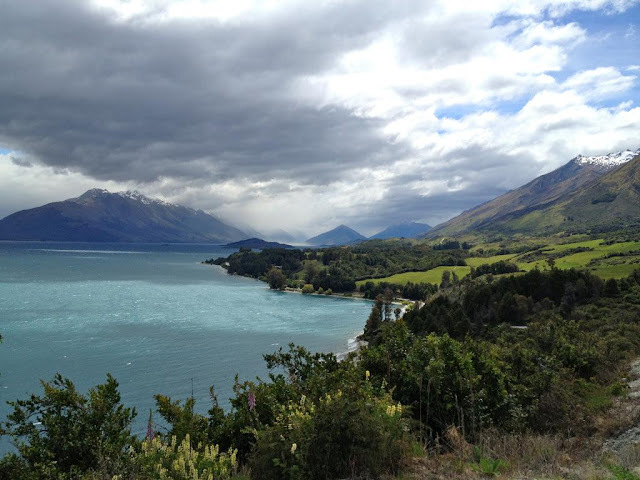 If there was only one place I could live for the rest of my life, that would be New Zealand. 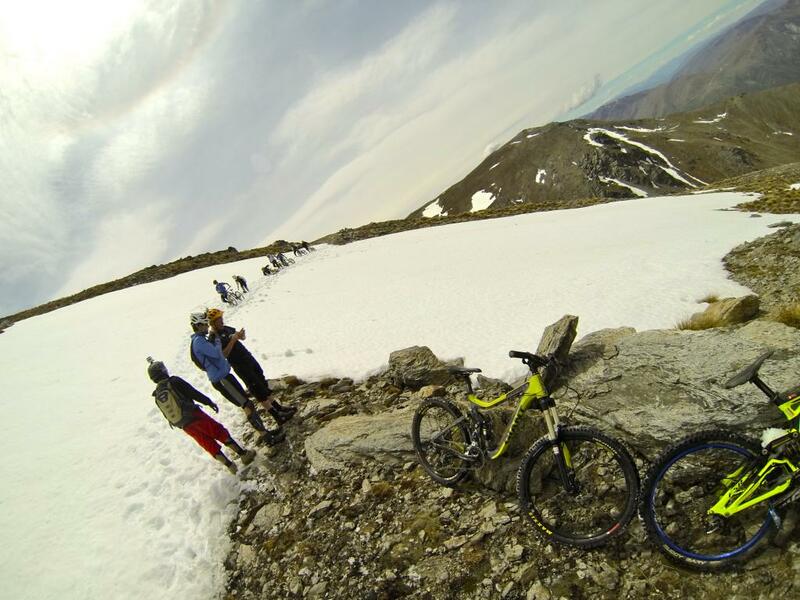 Paradise to outdoor lovers and heaven to avid mountain bikers. New Zealand is way ahead of most countries in terms of environmental protection and conservation.They not only recognize the importance of protecting the assets created by nature for future generation, they also recognize the importance of sharing these very assets to every individual regardless of rich or poor. To some people who value material asset and city lifestyle, New Zealand may be a boring place to live. 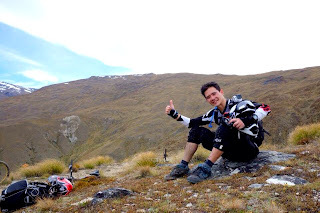 To people who love nature and outdoor activities like me, New Zealand is heaven. The concept of biking trails in New Zealand are similar to PCN in Singapore. 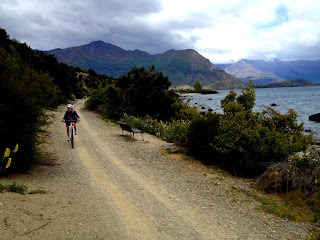 However, PCNs in Singapore are cemented in an artificial setting while that in New Zealand are more sustainable gravel trails in natural setting. The photo shows my son riding along the PCN trails in Wanaka, New Zealand. 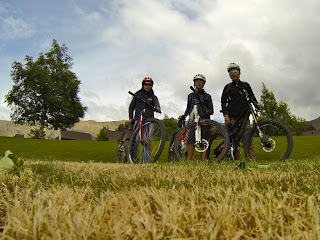 We took this self-timer photo along the lakefront of a vineyard at Wanaka. Beautiful vineyard with lake and snow capped mountain as backdrop! 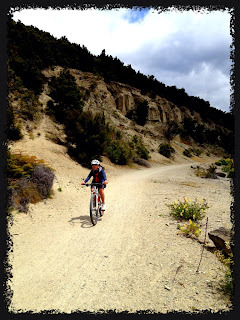 To me, the only enjoyment to ride on this stretch of PCN trails was the companion of my family! 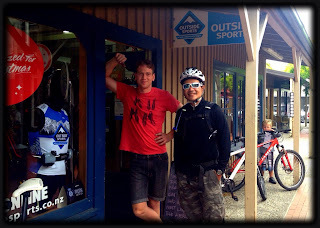 This is the bike shop in Wanaka where we rented two Specialized 29er hardtails for my wife and son. The staff Jacob (Red shirt) was extremely friendly and helpful. 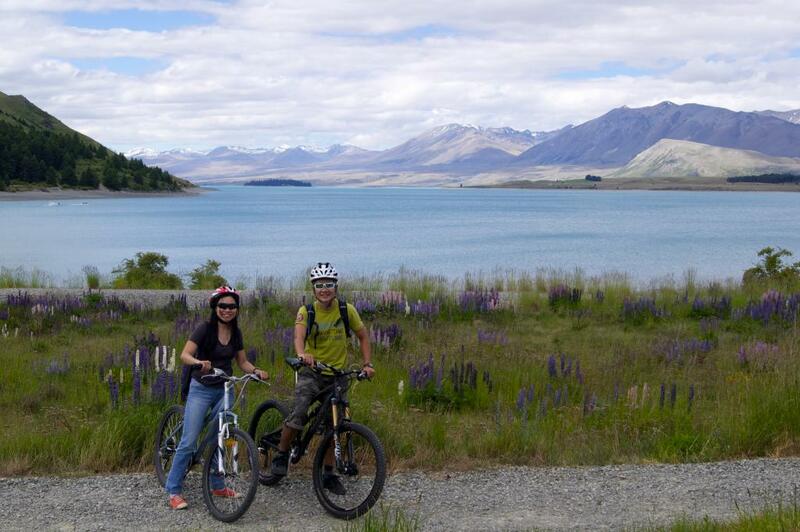 The bike rental cost NZ$35 each for half a day (4 hours) ride, including helmet. Leisure riding trails in Lake Takepo. A short ride from our motel to the Church of Good Shepard. 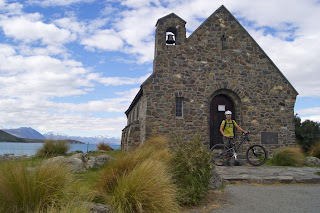 Quite happy to get this shot with my bike at Church of Good Shepard, after waiting ages for tourists to go off. Mountain biking and food should come hand in hand, especially after a long and hard ride. The food seems to taste better, especially with the right companions and environment. New Zealand may not be a food paradise compared to Singapore, if you look hard enough you could still discover some awesome food that you would die to eat. 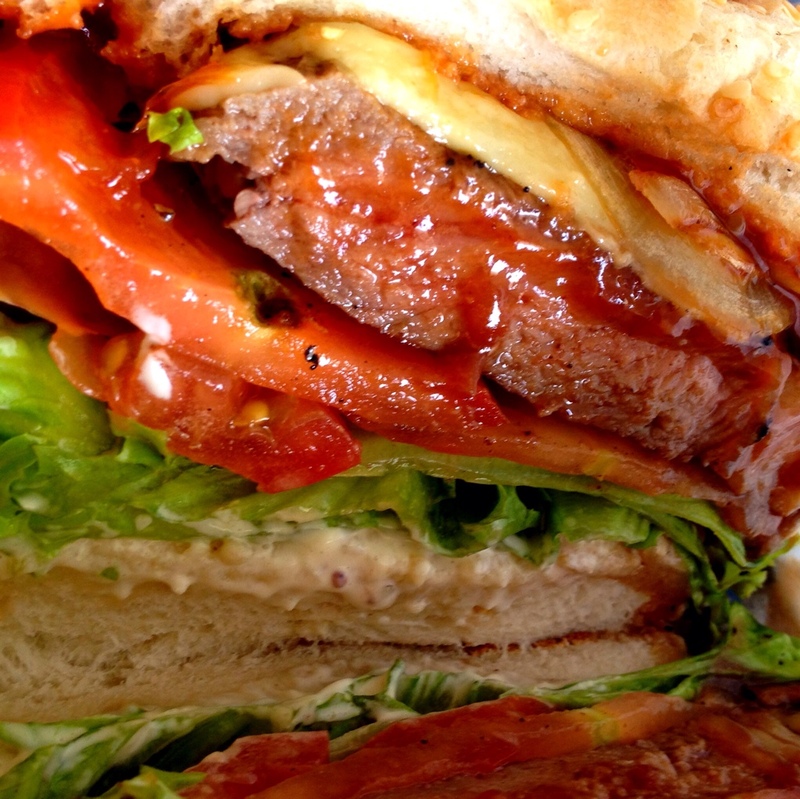 I discovered this steak sandwich at GYC cafe in Glenorchy, near Lord of the Ring shooting site. It cost about NZ$20, relatively cheap considering the thickness of the steak (at least 200g) and generous portion of bacon, egg and veges. MUST TRY!!! This stone grilled 400g NZ steak (THE CHALLNGE) cost NZ$27.50 at Mackenzies Cafe-Bar-Grill at State Highway 8, Lake Takepo. The beef looks very fresh. 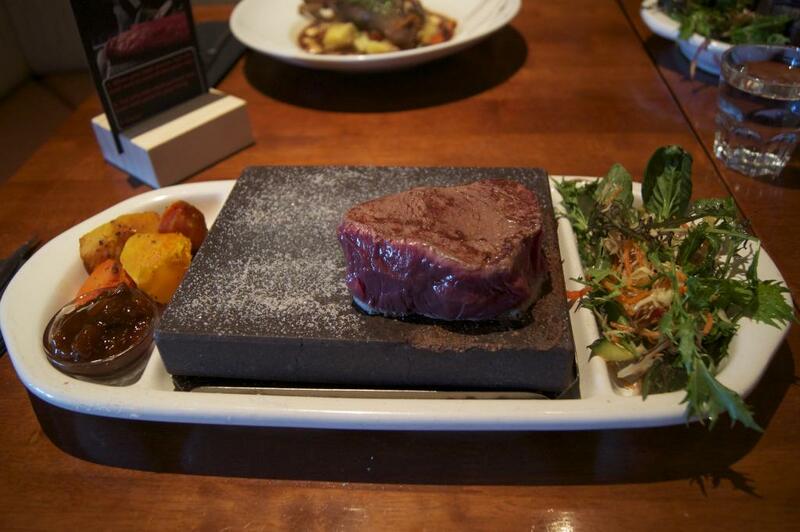 You could grill it to your liking. Very juicy and tasty even when it was over-cooked. Yes, I was a lousy chef.. Not a MUST TRY if you are not a beef lover. 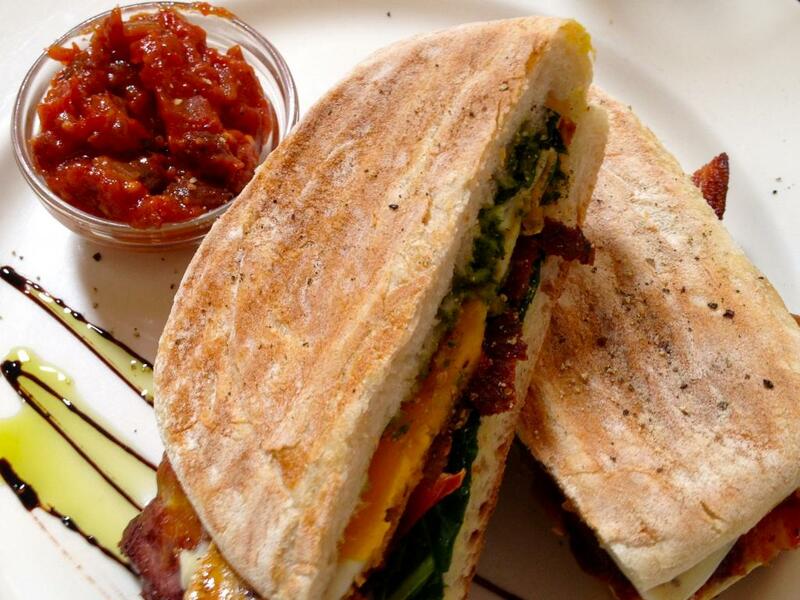 This breakfast sandwich cost NZ$17 at Vudu Cafe & Bar, 23 Beach Street, Queenstown. 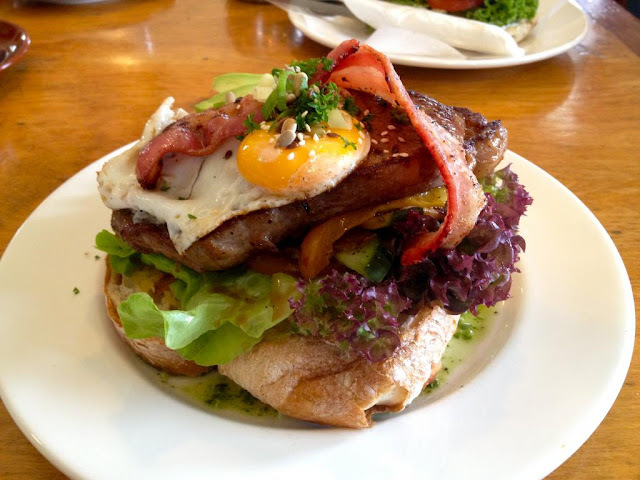 Vudu cafe was voted one of the best restaurants in Queenstown by TripAdvisor The sandwich ingredients include juicy fried egg, crispy bacon and well marinated veges. I love the tomatoes beans side dish, but my son would disagree. MUST TRY!!! Another awesome sandwich from Vudu Cafe. 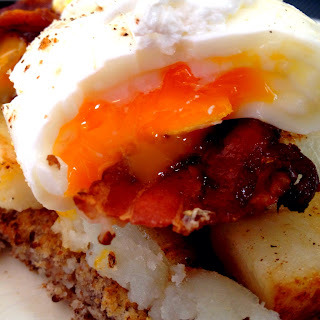 The poached egg sandwich with baked potatoes and bacon. Could not remember the cost, should be around $20. Heavenly! MUST TRY!!! This was my son favorite, fruits pancake from Vudu cafe as well. Could not remember the price, should be around NZ$12. Obviously my son love it but I prefer savory. If you have sweet tooth, this would be a MUST TRY!!! 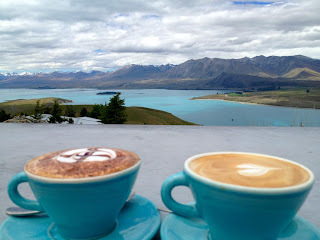 I quit coffee many years ago, but could not resist it in New Zealand. 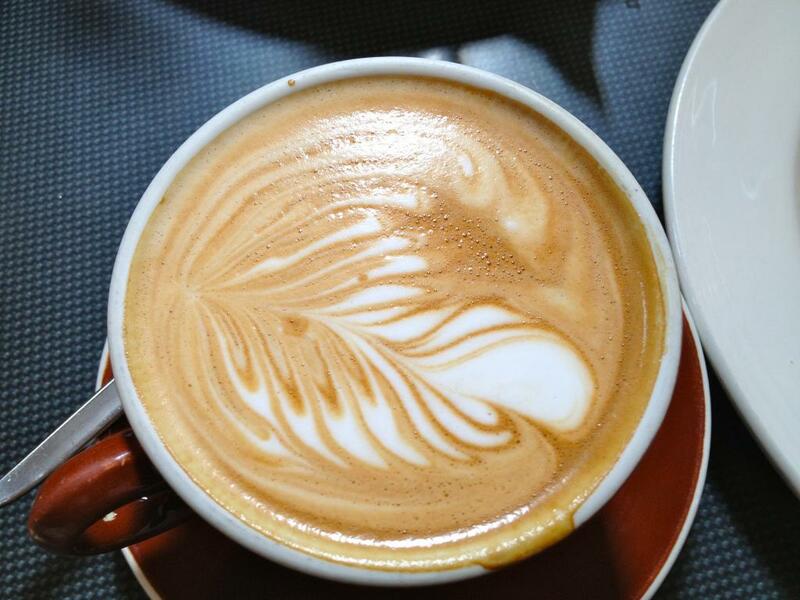 If you walked into any cafe in New Zealand, you would almost guarantee that the coffee is good. One particular awesome coffee is from Vudu Cafe, they were voted the best coffee in Queenstown. It cost only NZ$5 per cup, cheaper and better than Starbucks and Coffee Beans. 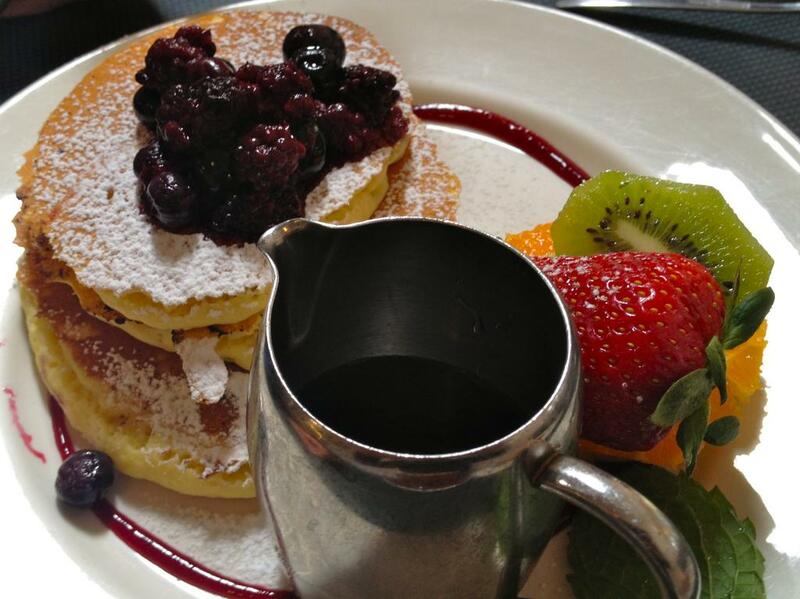 We had it every morning during our stay in Queenstown. MUST MUST MUST TRY!!! 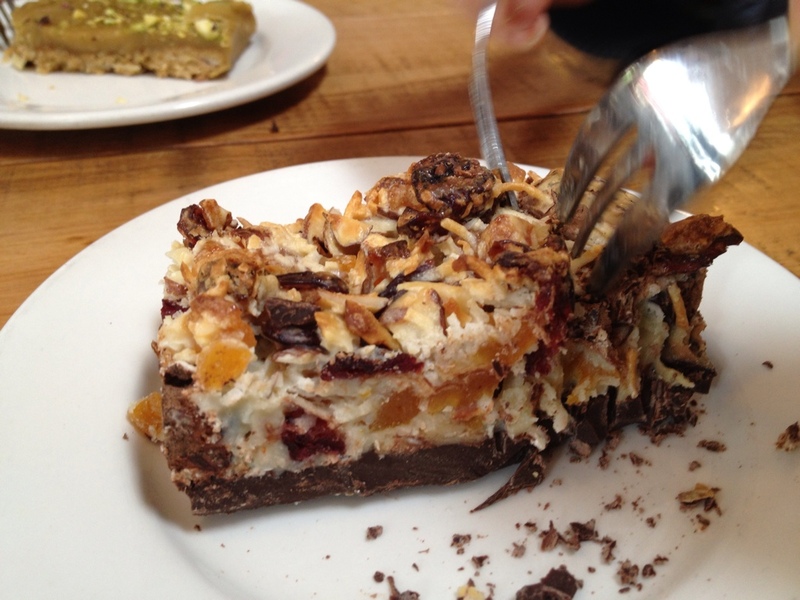 You can never go wrong with pastry in New Zealand. Even the muffins in petrol kiosk taste better than Singapore famous muffin. The authentic New Zealand nuts and fruits pastry were awesomely yummy. However, you must be patient and have strong teeth to enjoy it. Sold in Vudu cafe. MUST TRY! If you visit Lake Takepo, this Star Observatory Station is a must visit place. There is a cafe located right at the top, where you could enjoy bird-eye view of the whole Lake Takepo. Surprisingly the cafe served awesome coffee as well. MUST TRY! This is Fergburger, voted best burger in Queenstown. Almost all tourists and locals have tried Fergburger. Worst time to buy was during dinner time, expect long queue. 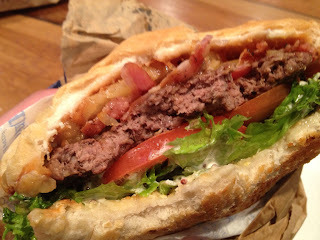 Normal Fergburger cost about NZ$11, the one in the photo is Steak Fergburger which cost about $17. I think the differences are the gravy, freshness and generous portion of ingredients. MUST TRY!!! This is the original Fergburger, which cost the lowest at $11. The portion was big enough for an adult. I had it almost everyday. MUST TRY!!! 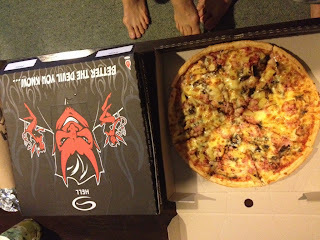 Hell pizza was one of the better pizza in New Zealand. It was setup about 8 years ago while I was still in New Zealand. They have since grown into many branches all over New Zealand. 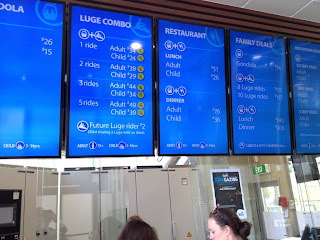 The prices were about 15% dearer than other home delivery pizza (e.g. Domino), but they taste twice as good. They were generous with toppings. 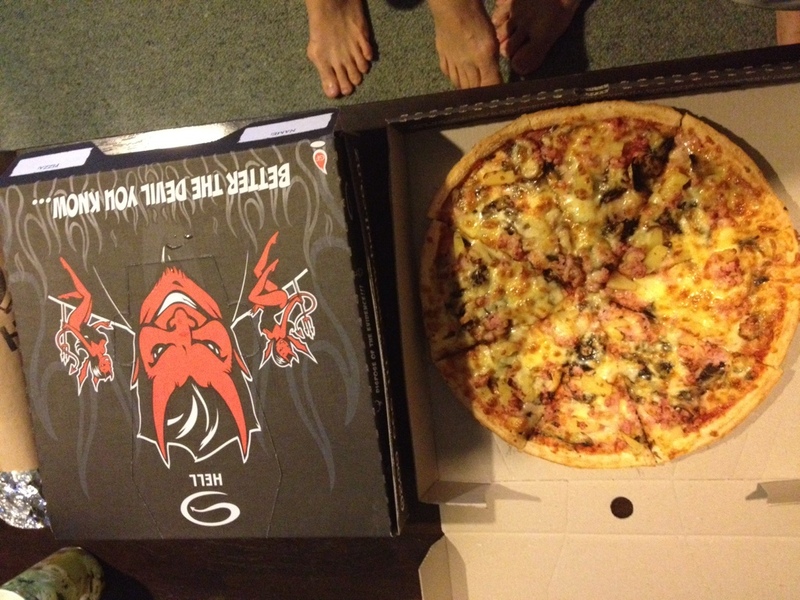 Hell pizza has created much controversial sometime ago when they gave away free condom for each pizza delivery. BTW, the church groups boycotted Hell pizza. MUST TRY!!! 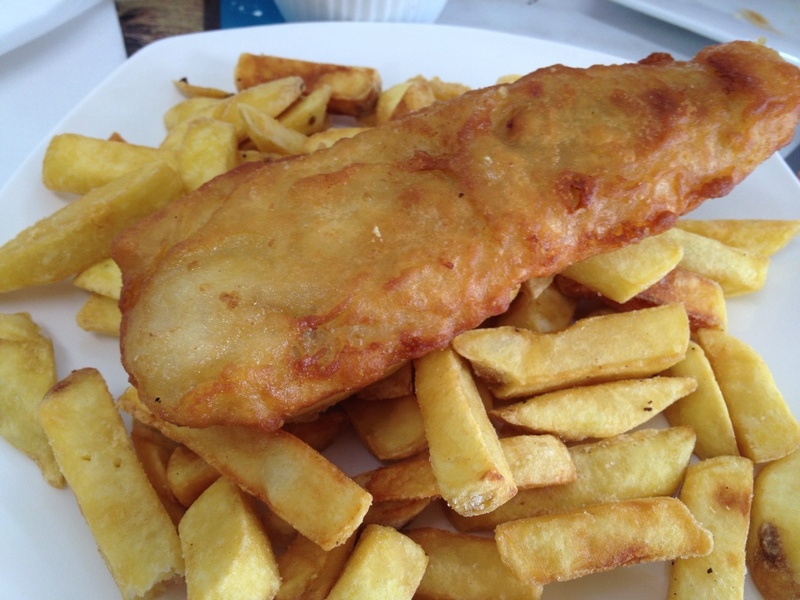 In New Zealand, nothing complete without fish and chip. Honestly, I was a bit disappointed with the deteriorating standard of fish and chip in New Zealand. Those fish & chip shops I used to patronize 7 years ago no longer around. The best I could get was at Rotorua, which was operated by Chinese migrants. 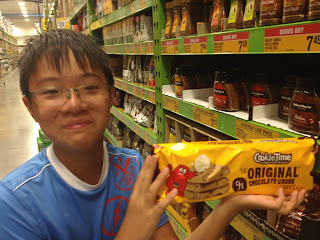 Although they were not as good as what I had, it was good enough to be recommend in my blog. It cost about NZ$7 with chips. GOOD TO TRY. Who said New Zealand does not have good Chinese food? Many Chinese restaurants located in Auckland offer good authentic cantonese cuisines, including this roast duck at Botany town. 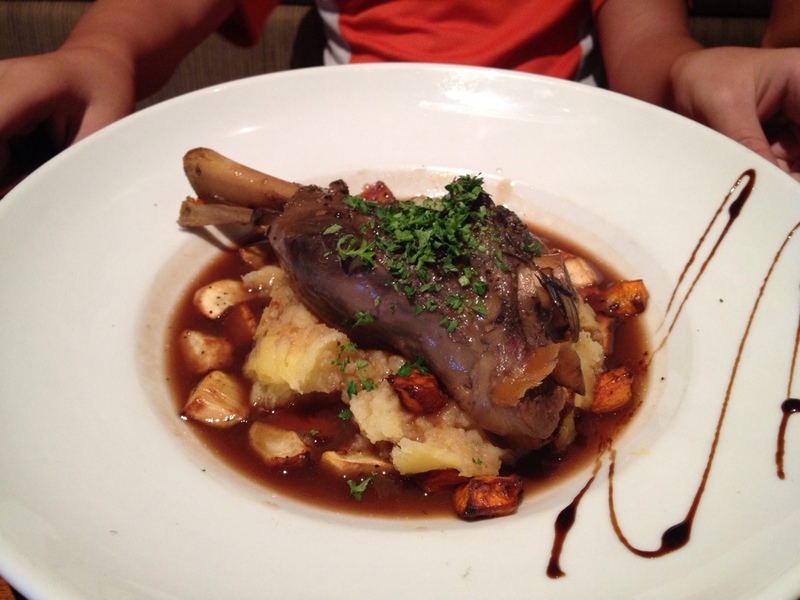 Although the restaurant has just changed owner, the new chef maintained the same level of standard as the previous chef. The meat was awesomely tasty and tender. The price was similar to Singapore. MUST TRY!!! 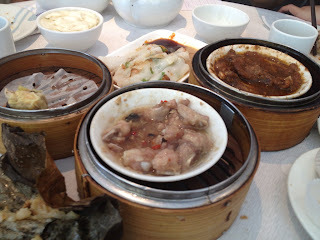 This was the best tim-sum restaurant in New Zealand, which could be found in New Market, Auckland. 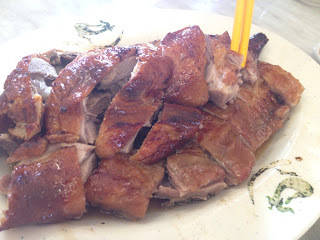 The prices were similar to Crystal Jade in Singapore, but the portion of the dishes were much bigger. The tim-sum is authentic Hong Kong style, taste so much better than Singapore. As my brother-in-law knew the owners, we were given good discount. MUST TRY!!! This is the best fruits' ice cream in New Zealand. 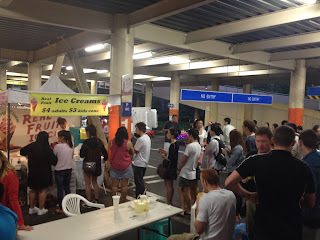 The shop only opened on Sunday at night market located in Glenfield Westfield carpark, North Shore, Auckland. The ice-cream was mixed with real fruits in a mixer. The taste was so refreshing that you felt like having more. It cost only NZ$4. MUST TRY!!! 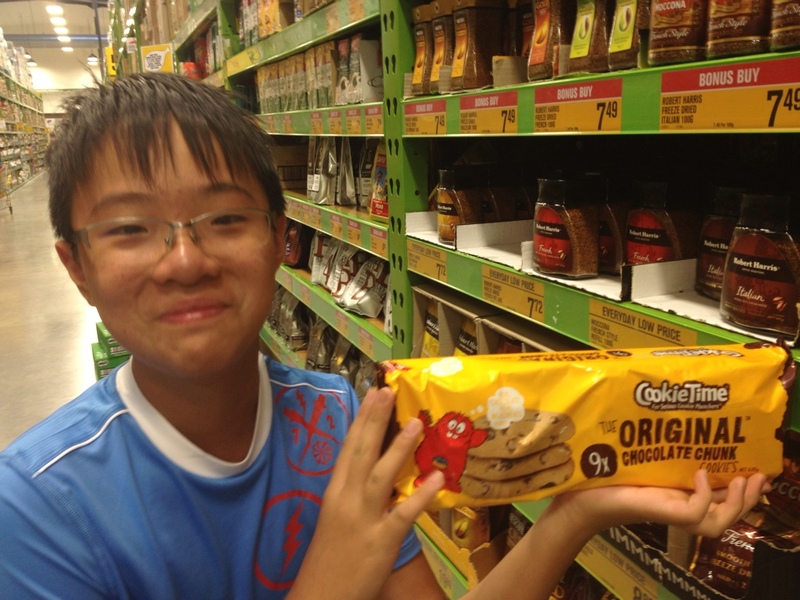 If you ever visit New Zealand, you must try Monster cookies. It is a New Zealand icon, the proud kiwi product made by kiwi company. I remembered my son had it almost everyday while we lived in Auckland many years ago. It could be purchased in all supermarket, groceries stores and petrol stations. MUST TRY!!! New Zealand has changed so much since I left 7 years ago. Sometime, I wonder if I am the one who changed. The fisherman story that was told by my boss kept hovering in my mind. Is this the very land that is within my grip is the ultimate place for my family? New Zealand is a wonderland to nature lover, heaven to mountain bikers and paradise to people who love outdoor activities. New Zealand is blessed with all these resources and assets that many of us could only dream to have. The vision to build mountain bike trails all over New Zealand has motivated me to return to this adopted home. I am back to drawing board to plan my next trip there. I will return! Great write up. Thanks for the inspiration! Great post, thanks for sharing and letting me dream. Your pics and writeup just made it a little more real for me! Melvin, thanks for reading. 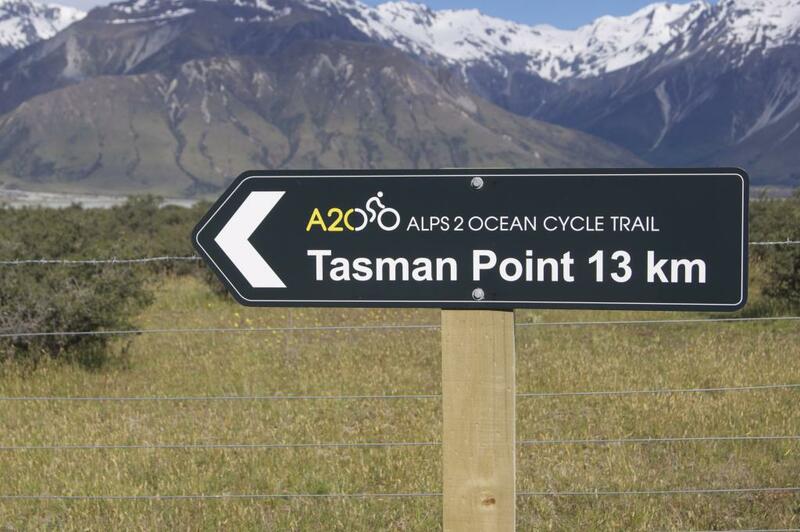 I am glad the write-up motivates you to ride in New Zealand. Cheers! Hi Chris , hows the mrp 2x10 holding up ? is it tough to get it set up ? The mrp 2x10 was holding up awesomely well. Precise gear shift, not a single chain drop. As I was running out of time, I got it set up by my mechanic. I think it should be easy to set up. 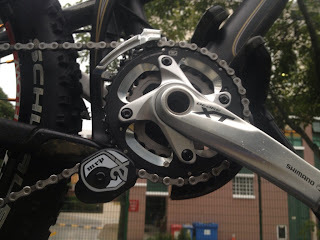 You need to ensure that the front derailleur is meant for dual rings, the triple rings front derailleur will not work well. Hi master! Hope u r recovering well. Can I check how much u spent on this trip? I wan to go for this trip! ;) pls let me know. Thks!! I am doing well, thanks. If you budget for yourself, S$3,500 to S$4,000 (all-in) should be sufficient. If you go with friends, you can share accommodation and land transport. That will bring down the expenses a bit. If you go with your family (3pax), prepare about S$10,000. Hi master. Thanks for your reply.